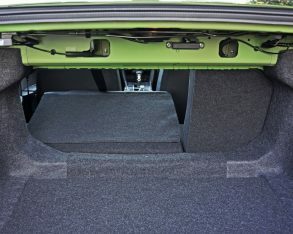 more than 16 years ago, which makes it one of my most reviewed models ever. 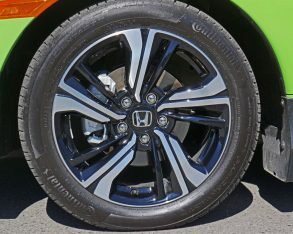 Thank you Honda. 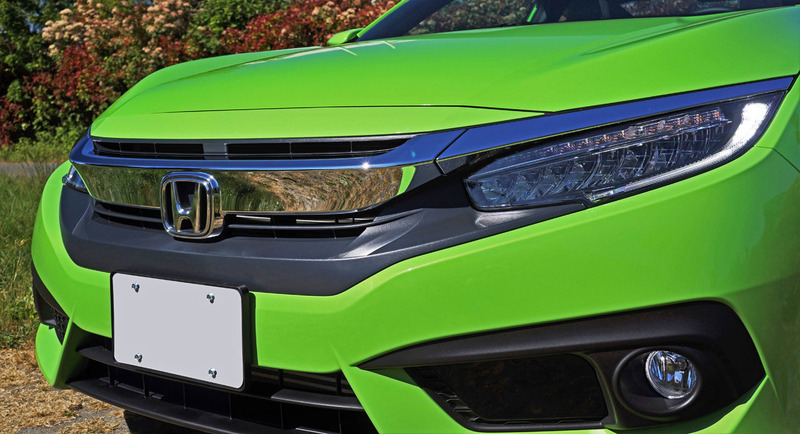 This realization makes me grateful for the Japanese brand’s support over the years, as well as for all the great memories with this special little car. 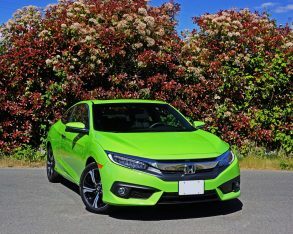 I may not have gloated over its many permutations with the same fervour as I laud praise on this newest model, but to be completely honest even the worst Civic was better than most of its competitors. 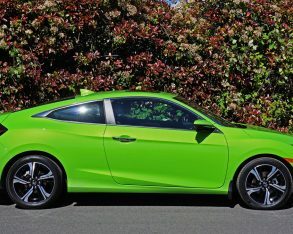 Of those 23 Civics eight were Coupes, which while a rather clumsy segue brings me to my latest test car. 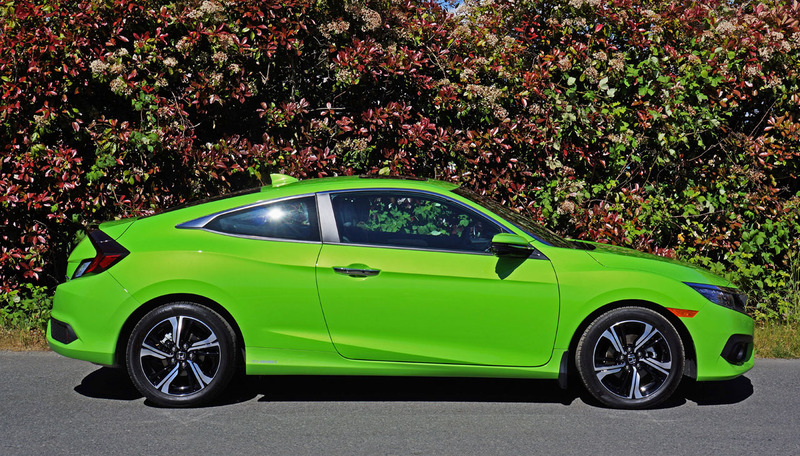 Therefore without further ado I add a ninth Coupe and 24th Civic to my ever-lengthening list. 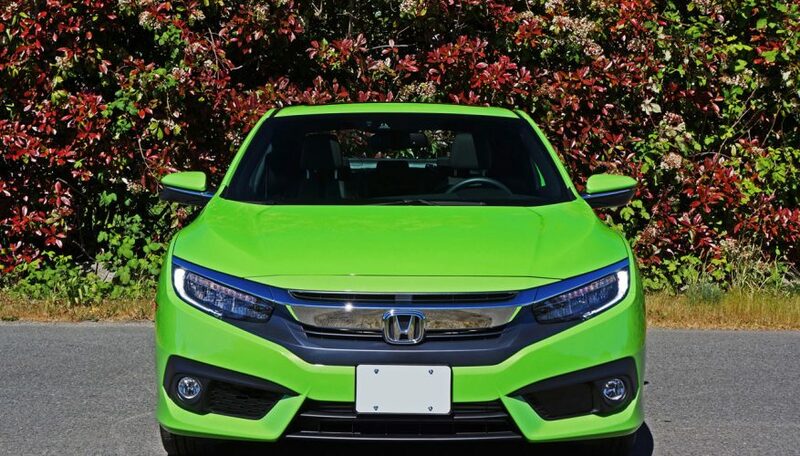 you’ve never experienced a Honda Civic, you’re truly missing out. 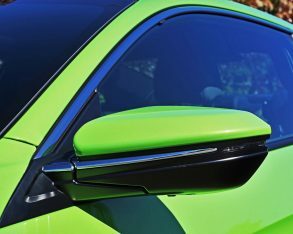 Even if you only drive premium branded sport/luxury models, take note there’s something very special about this car that not only sets it apart from all peers, but also gives it near premium cachet. 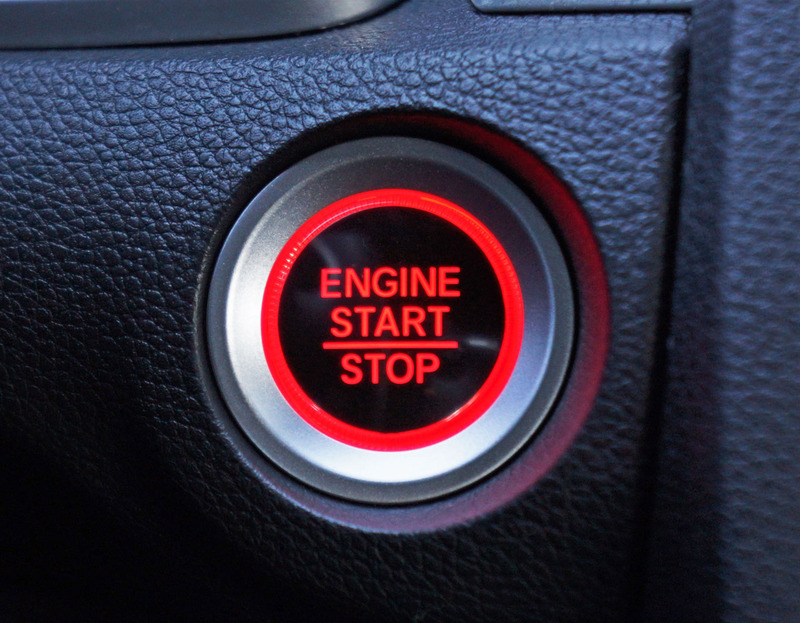 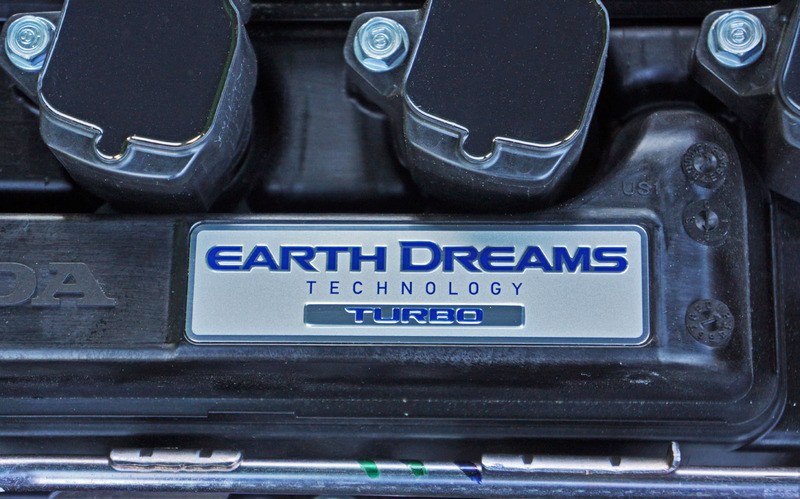 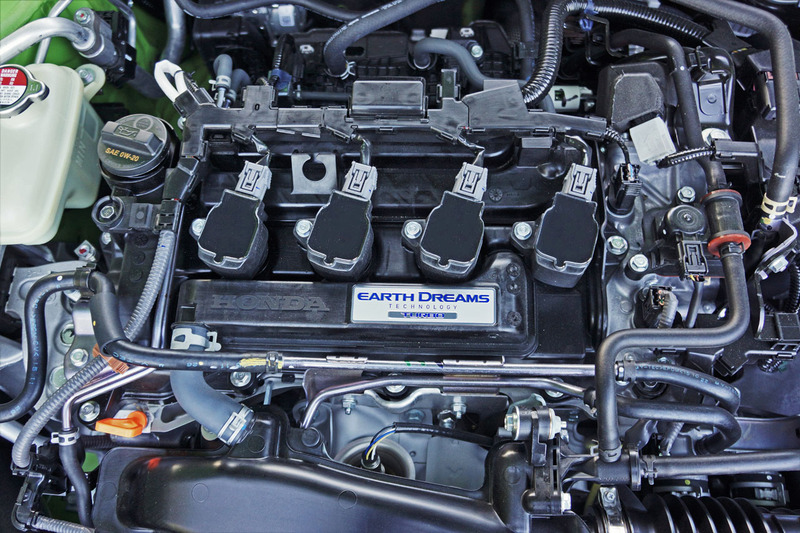 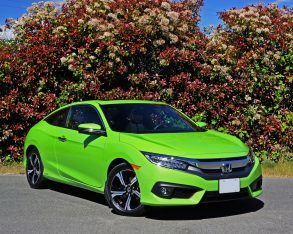 This is especially true of any Civic Si, a car fitted with the best six-speed manual made, period, and one of the most entertaining engines and brilliantly capable chassis’ in the industry. 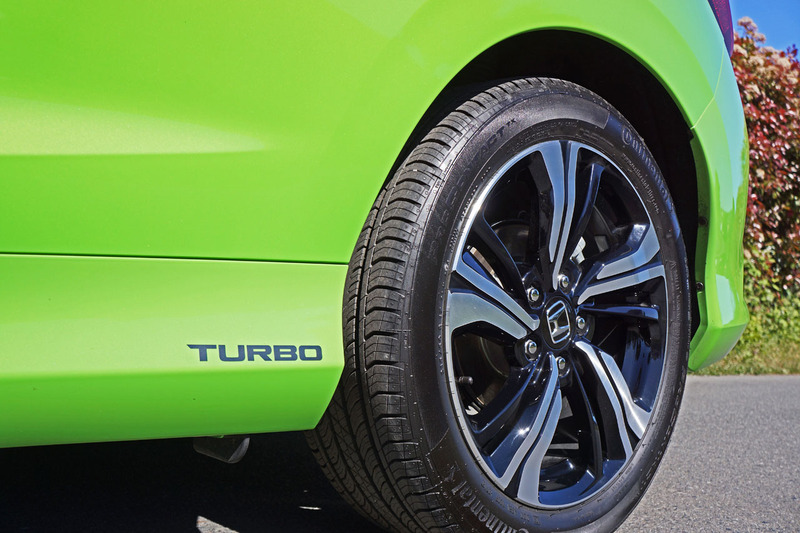 Many are faster, but none better. 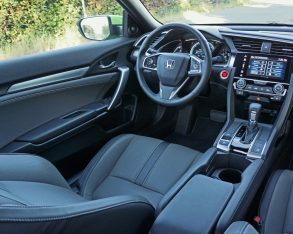 compact lore, but despite its eye-searing styling, big machine-finished alloys, and perforated leather-clad, high-tech cabin, this particular Honda is more about cruising the strip than conquering the track. 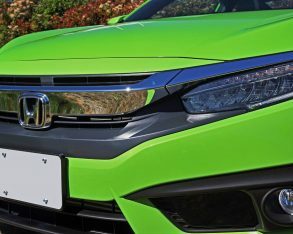 To be clear this has very little to do with the powertrains available, Honda offering up two impressive engines this year. 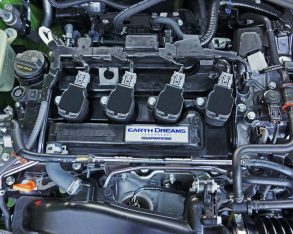 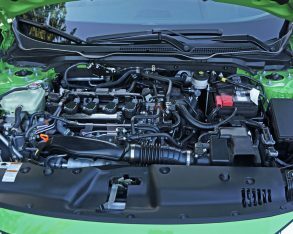 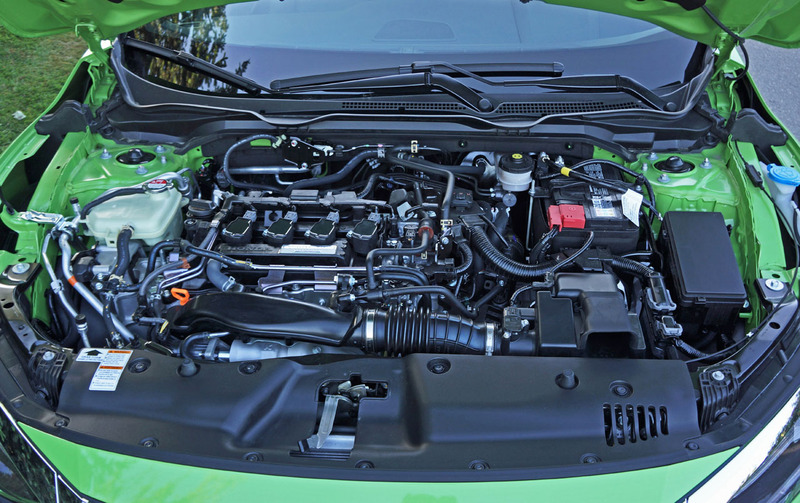 The first is the base LX model’s naturally aspirated 2.0-litre four, which is capable of 158 horsepower and 138 lb-ft of torque. 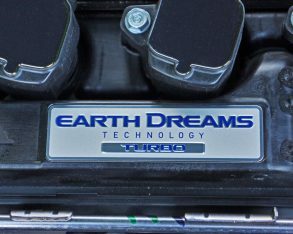 A wonderful little engine, I tested this one out last fall in Sedan EX trim and really enjoyed its performance. 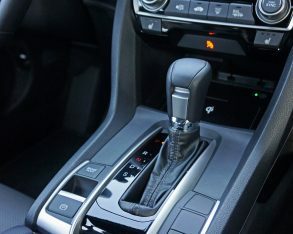 Granted, I would have had more fun in the base LX with the manual gearbox, but considering the vast majority of buyers opt for the automatic we journalists rarely get opportunity to drive DIY gearboxes anymore. 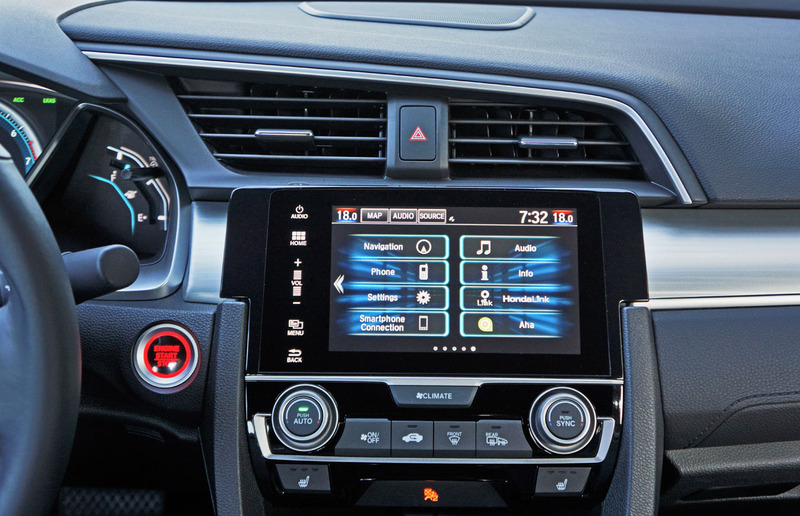 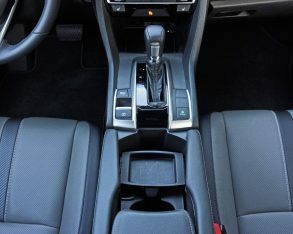 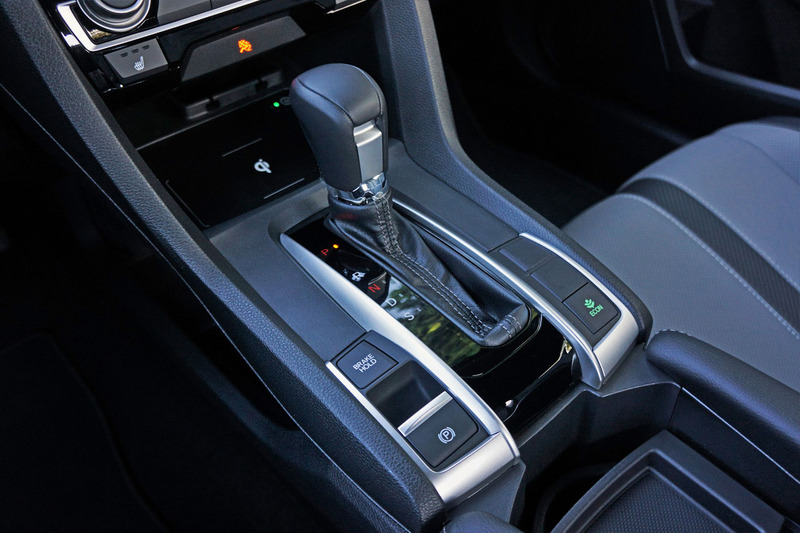 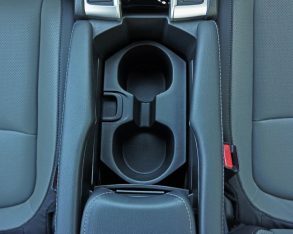 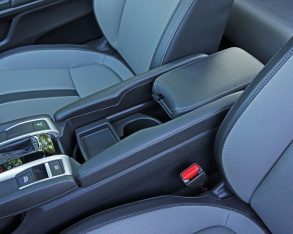 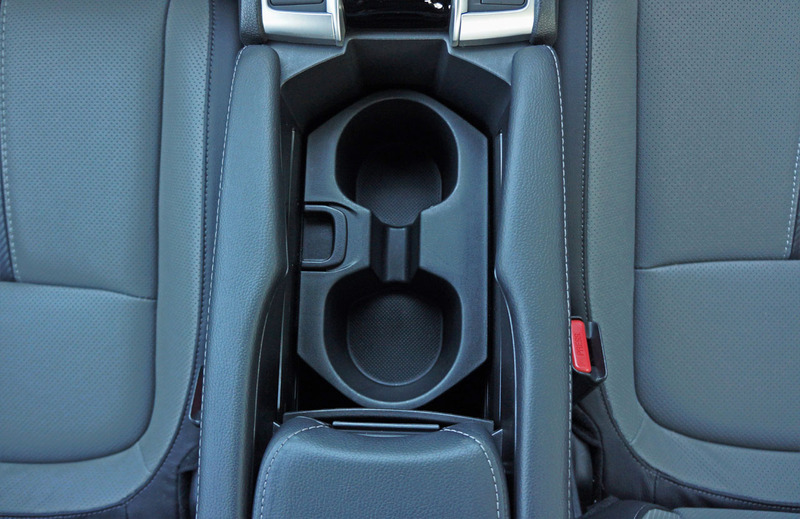 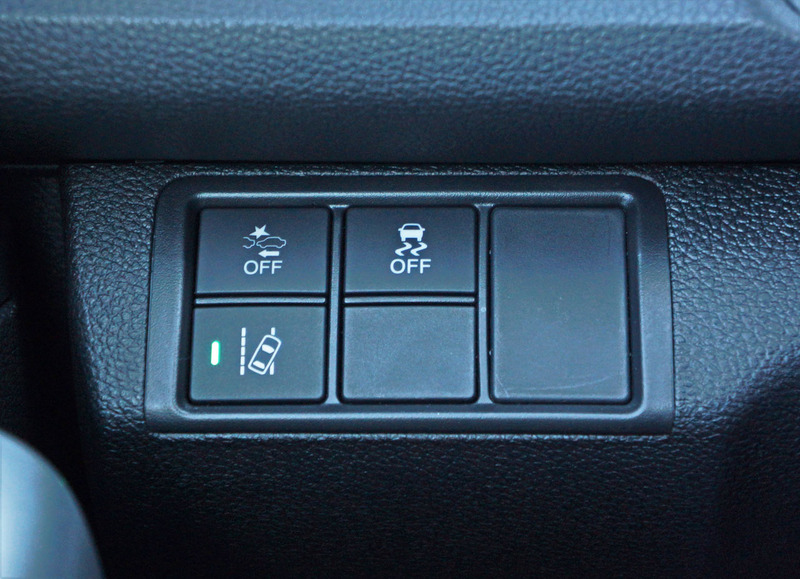 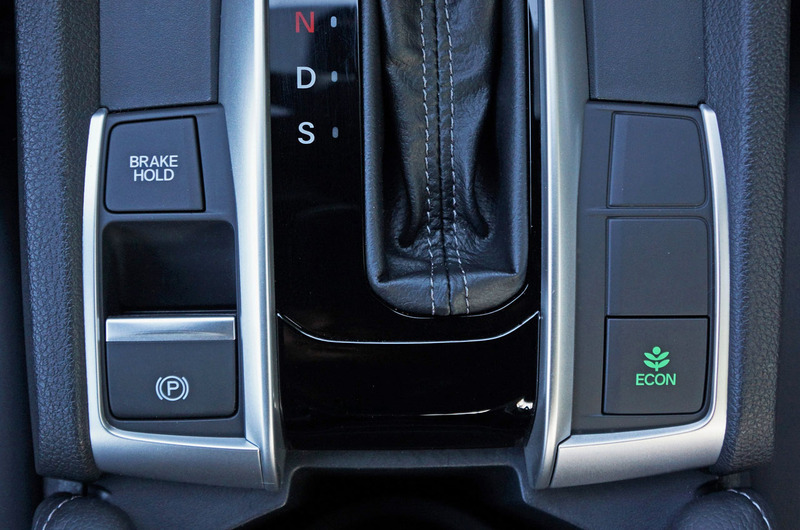 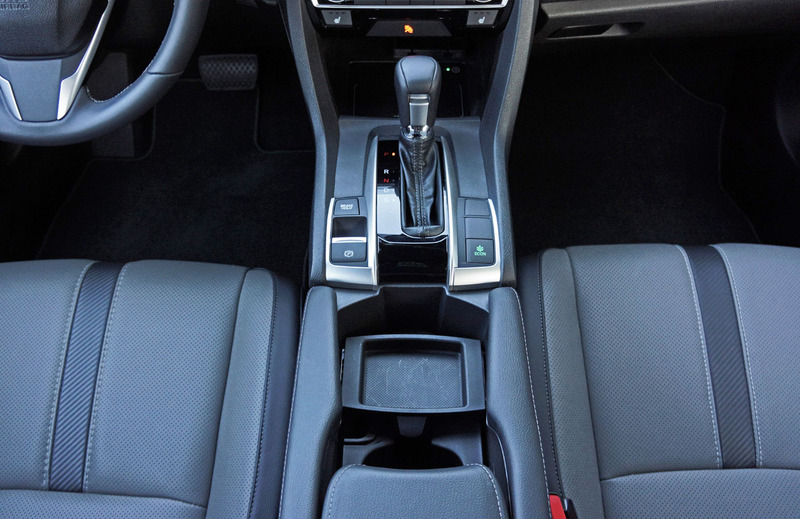 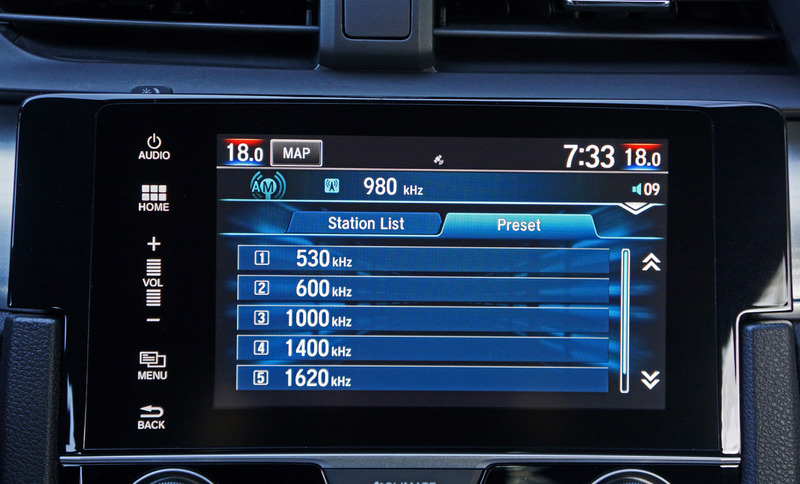 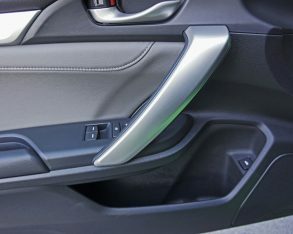 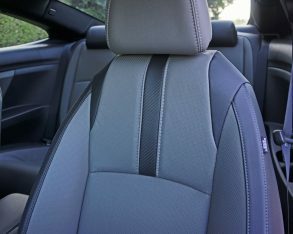 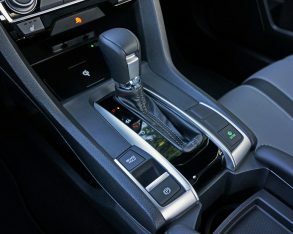 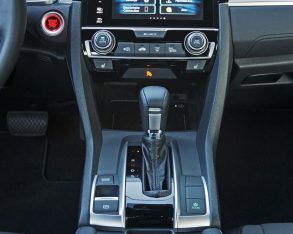 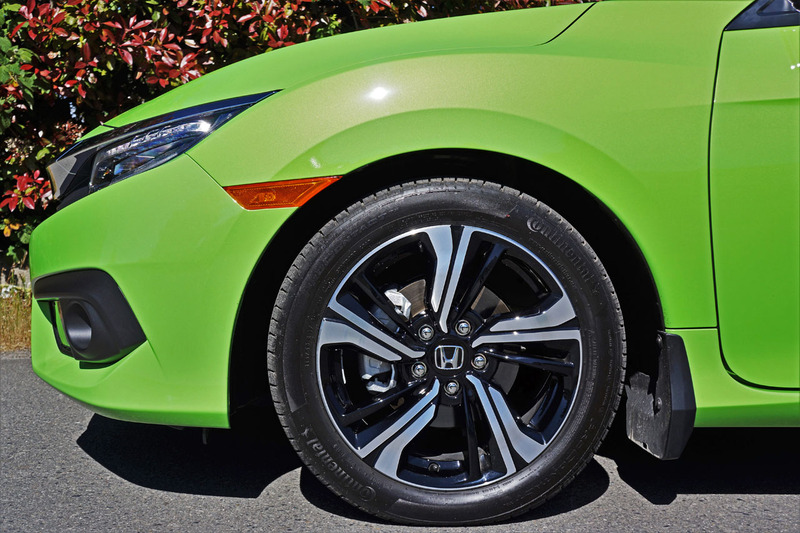 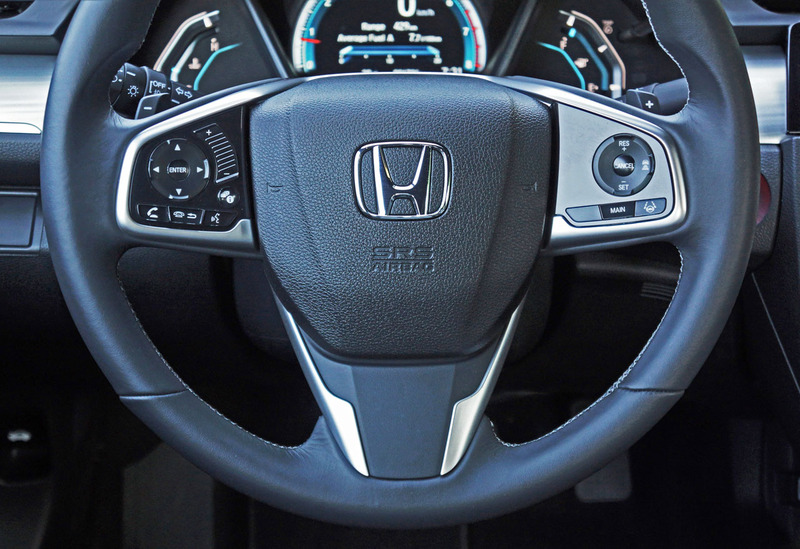 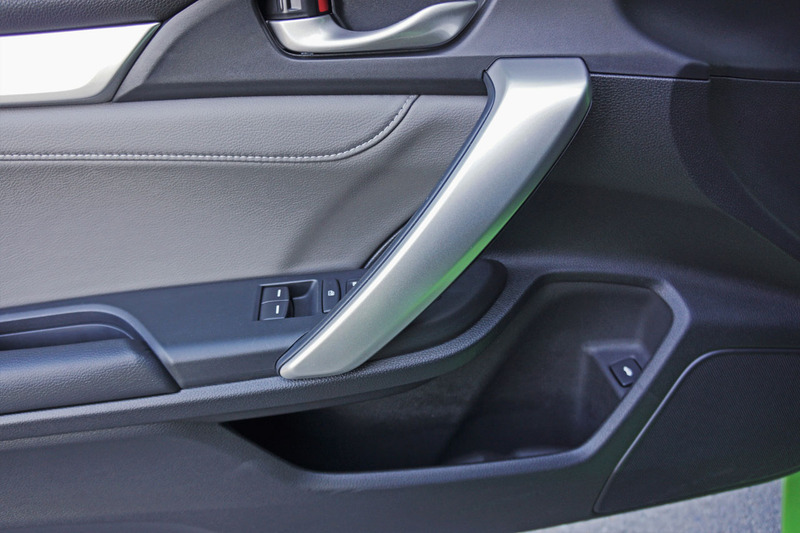 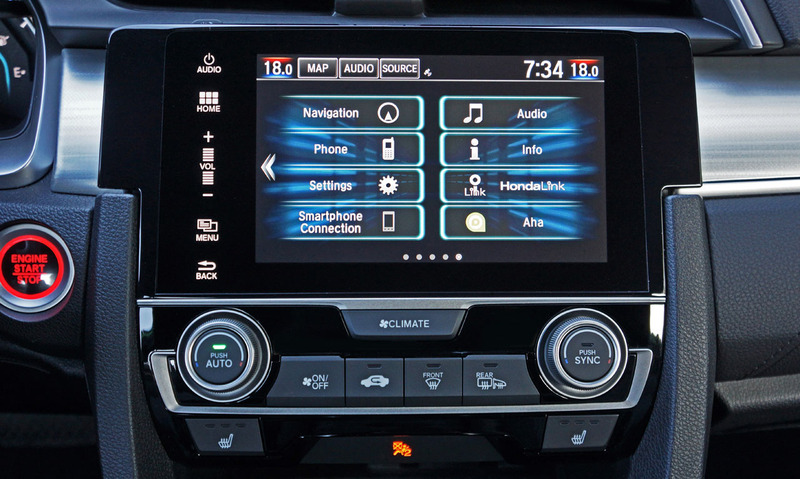 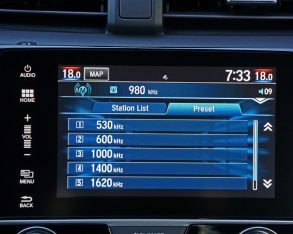 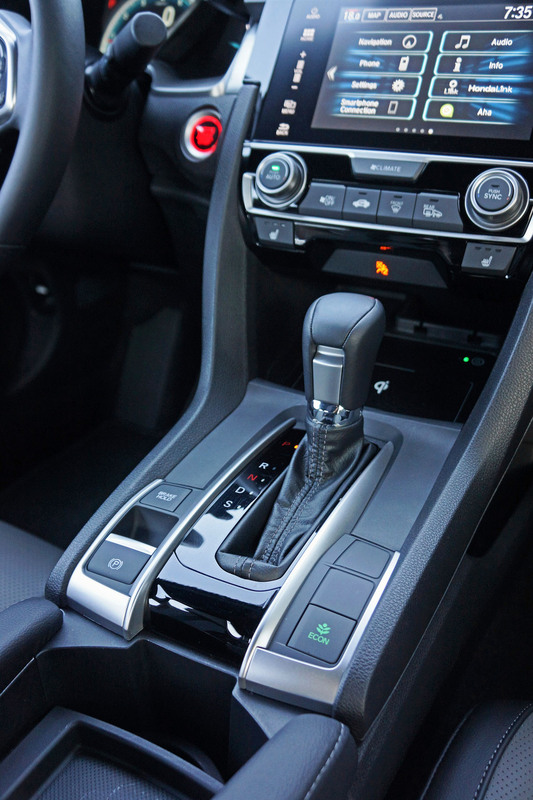 In fact, the take-rate for manuals is so low that Honda only uses one in the 2016 Civic’s most basic trim; the EX and Touring models coming standard with the CVT. 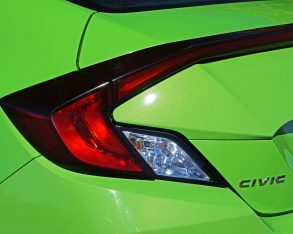 available above that, whereas the upcoming Civic Type R (which will debut at SEMA in November) will be even more potent than the previous Si. 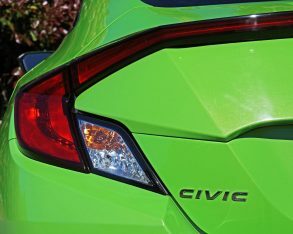 Civic Hatchback models that make the six-speed manual available throughout the trim range, or wait for the upcoming Si and Type R, because as good as this sport-tuned CVT is, I found myself leaving it in Eco mode most often, which I must admit was a big win when I needed to refill the tank. 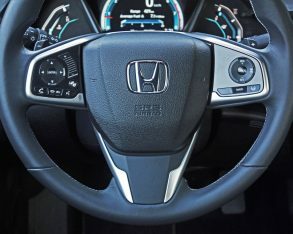 Honda’s claimed rating for the upgraded turbo four and CVT is 7.6 L/100km city, 5.5 highway and 6.7 combined, even better than the base engine/CVT combo’s 7.8 city, 5.8 highway and 6.9 combined rating despite the added power, whereas the base mill with the six-speed manual is least thrifty at the pump at an estimated 8.9 city, 6.1 highway and 7.7 combined. 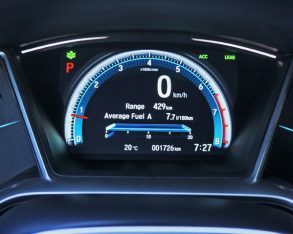 Still, any of these numbers read economy car rather than performance-oriented sports coupe, which is a big bonus to Vancouver buyers that really haven’t benefited much at all from the drop in oil prices. 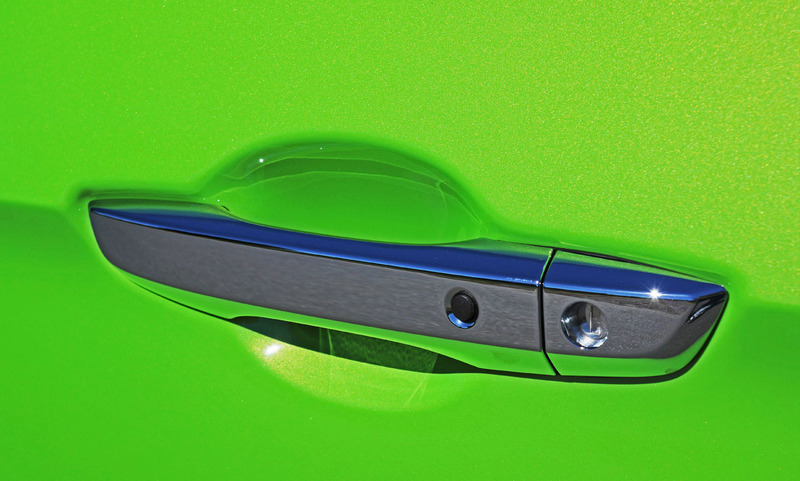 old car’s big green blob on the instrument panel. 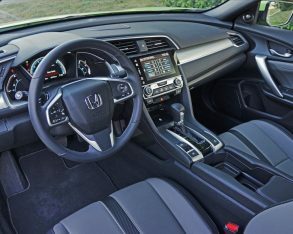 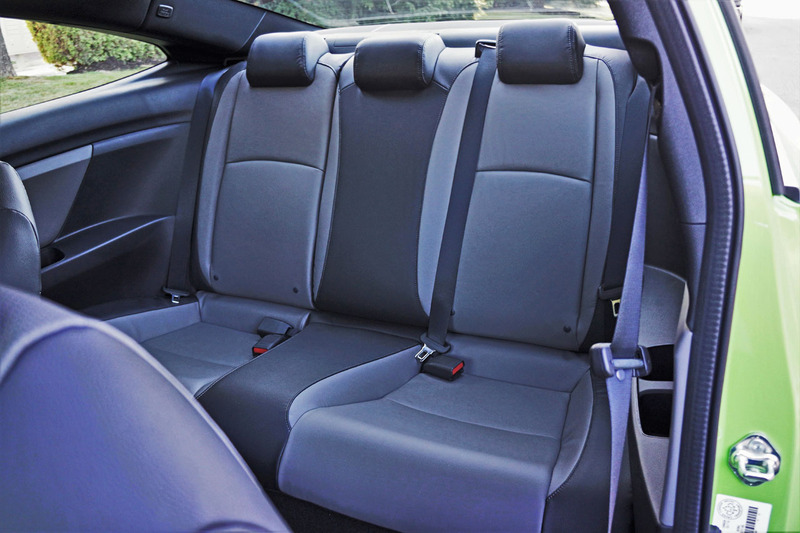 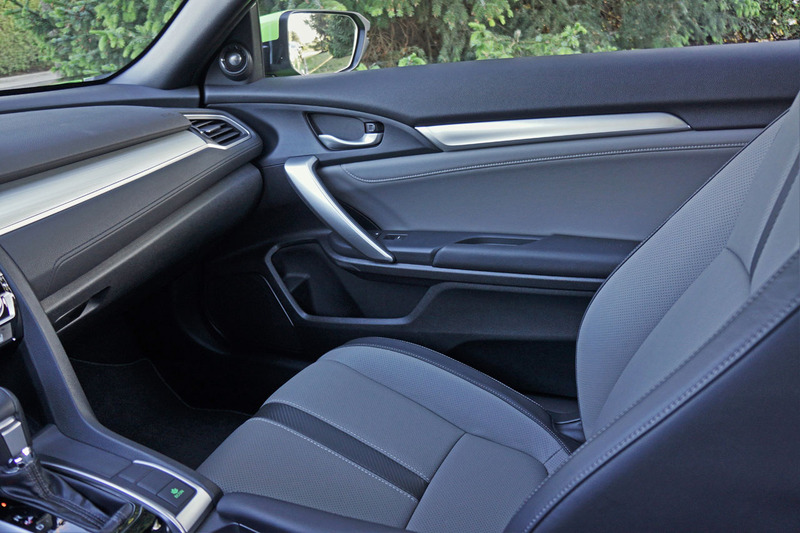 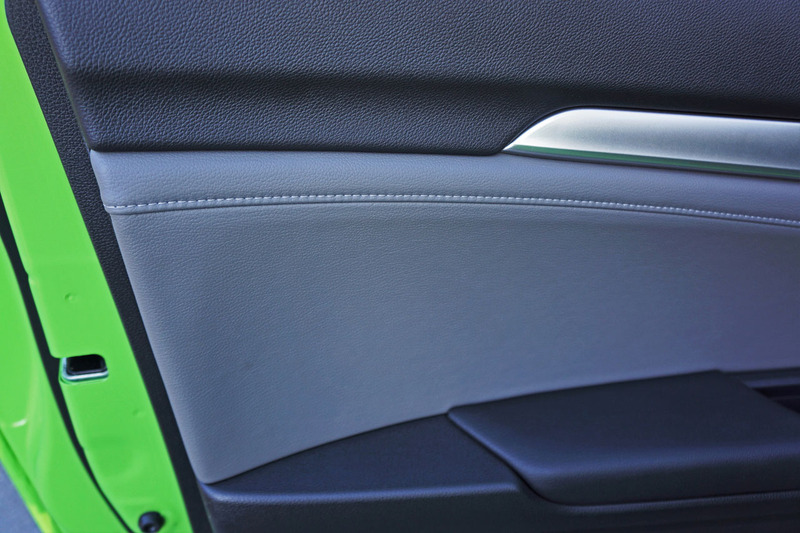 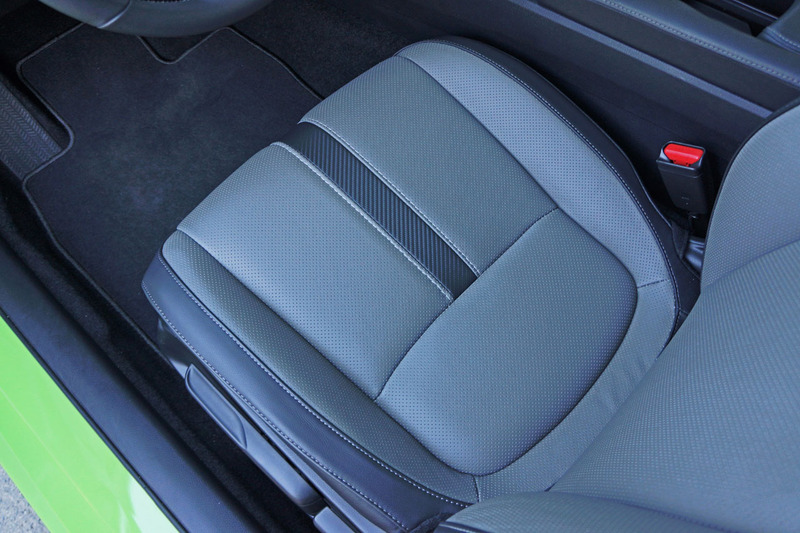 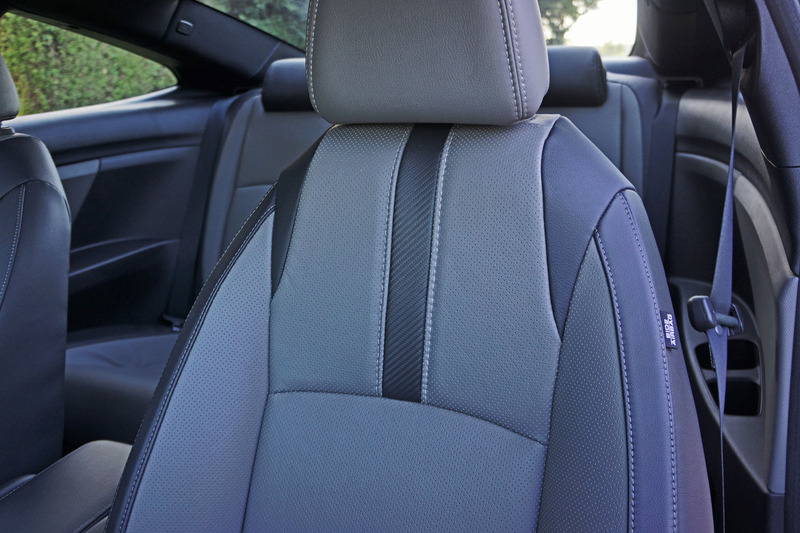 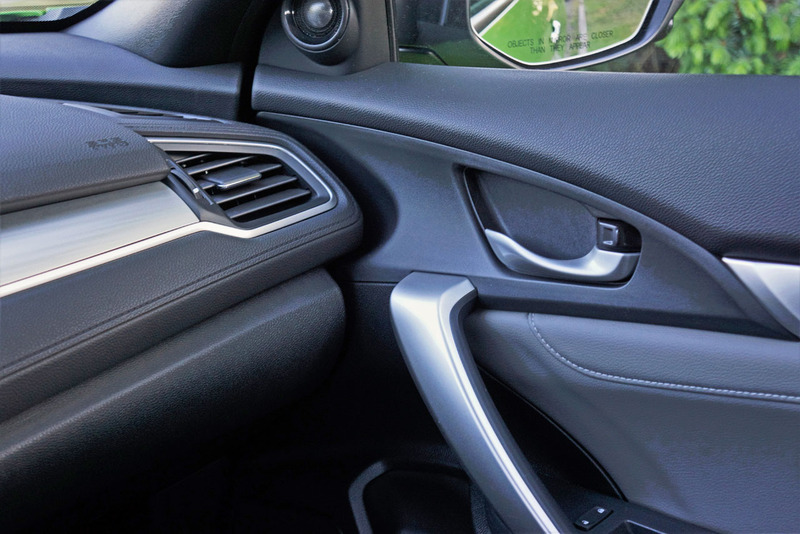 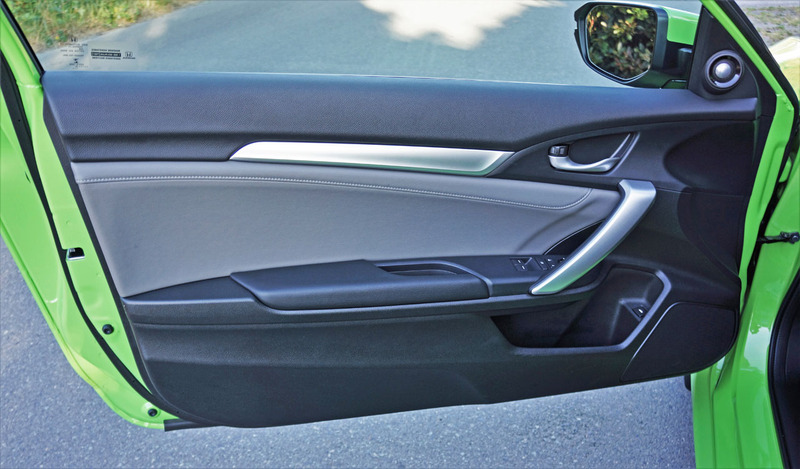 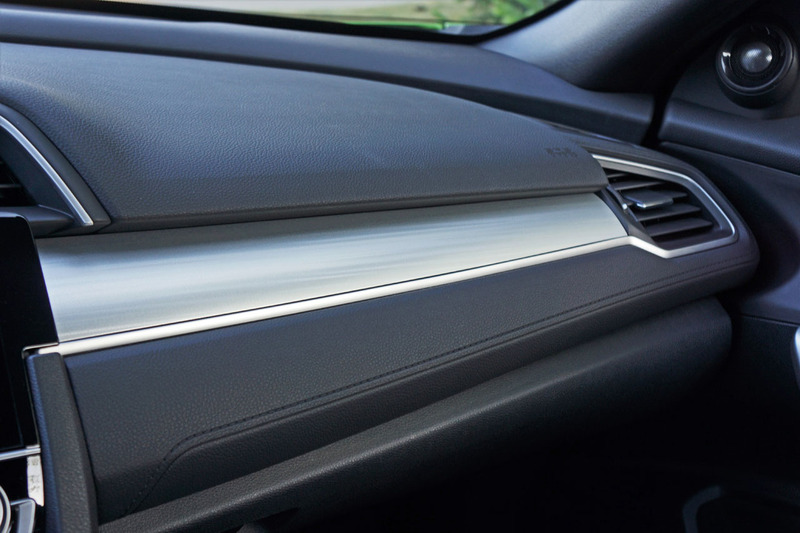 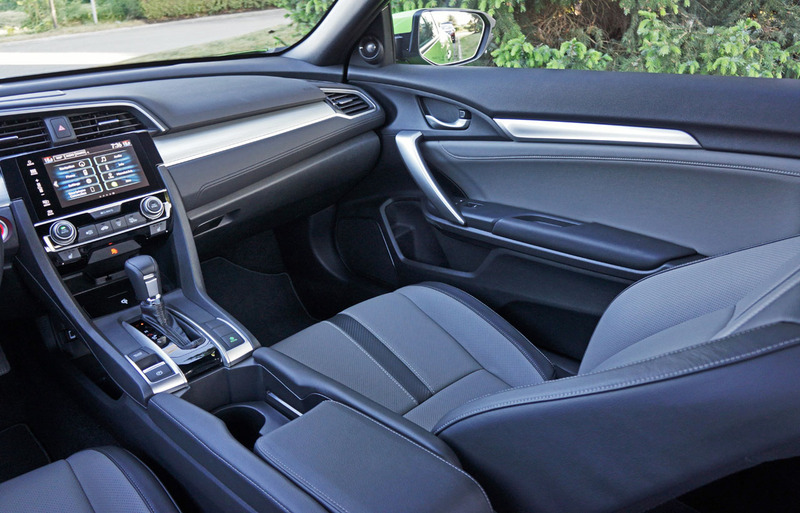 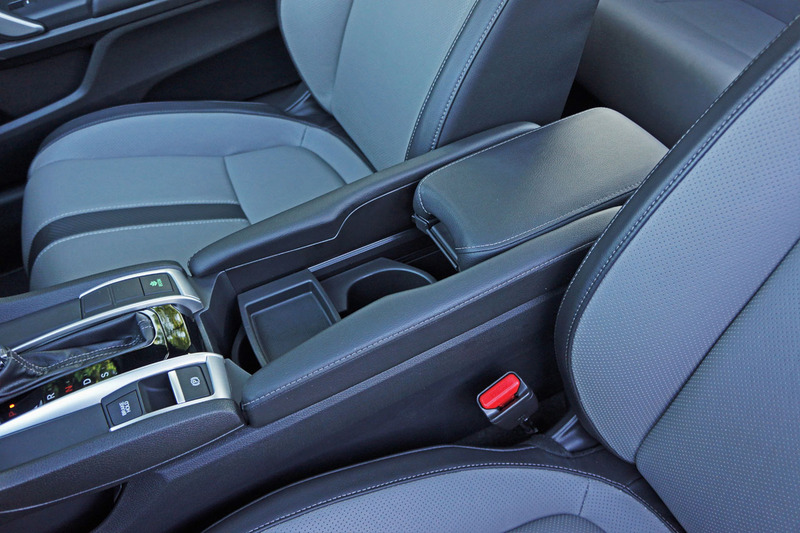 This newfound sophistication isn’t just kept between the seats, but rather the entire Civic cabin is a feast for millennial eyes. 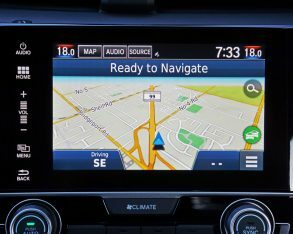 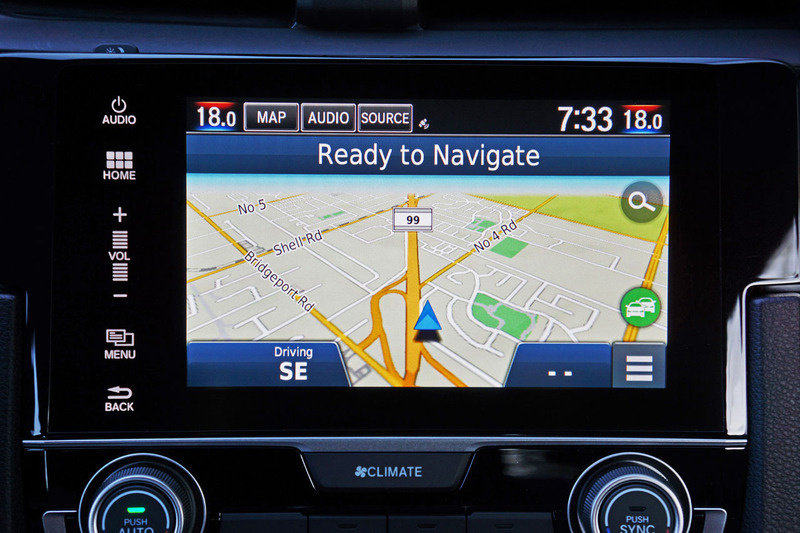 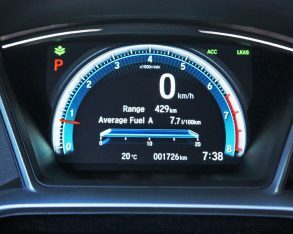 Really, while its bright, high-resolution full colour displays directly target those who spent most of their formative years in front of digital screens, even those of us who remember life before colour TVs will appreciate the new Civic’s high-tech electronic interfaces, from the brilliantly clear and colourful primary gauge package featuring a seven-inch TFT multi-information display at centre, to the superb infotainment display jutting out atop the centre stack it’s the best of the best, even superior to many luxury-branded compacts in both form and function. 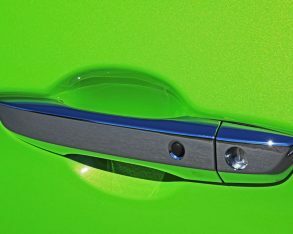 matte finished for less sheen, while ultra stylish brushed aluminum-look inlays enrich the design. 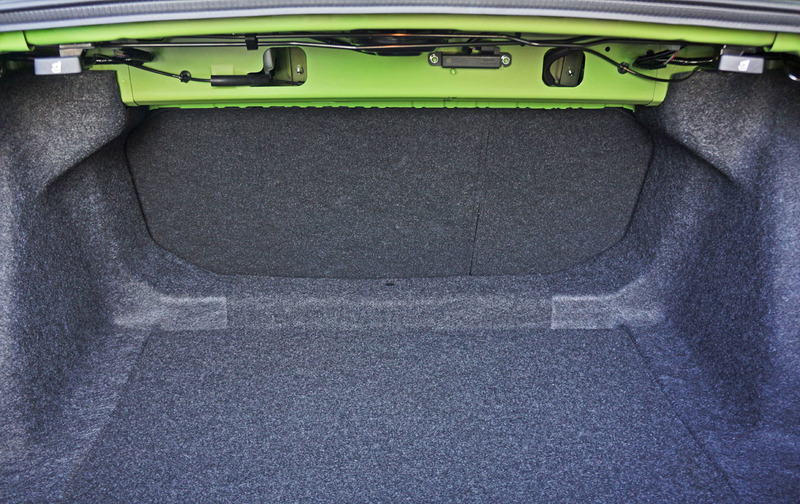 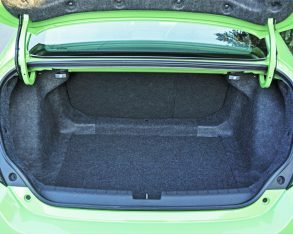 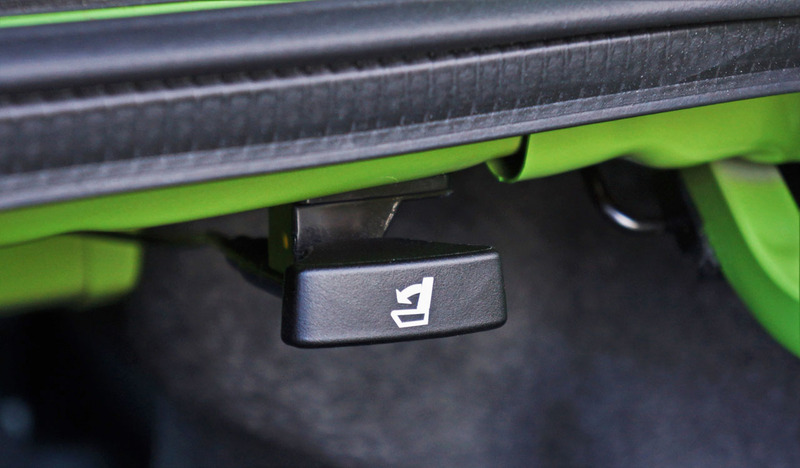 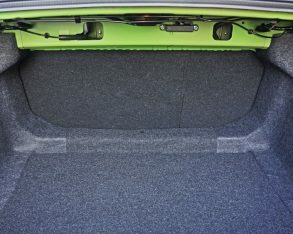 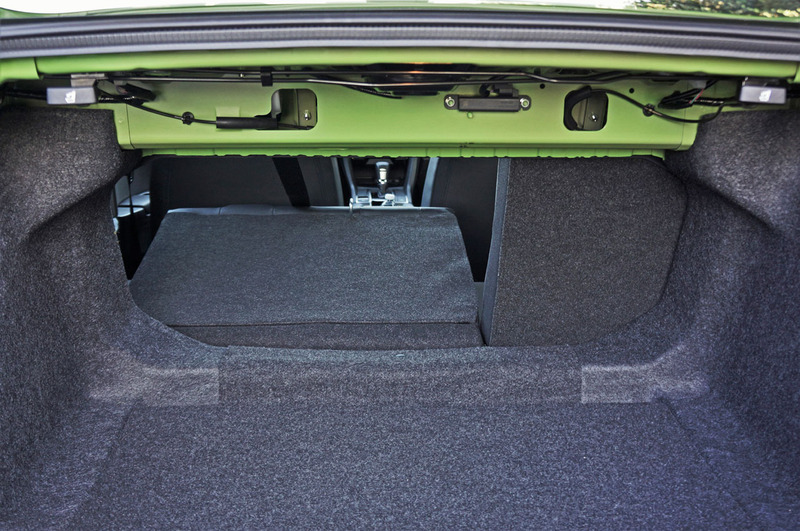 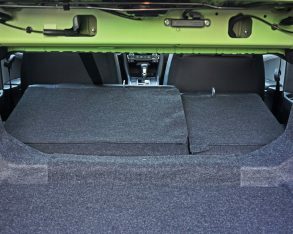 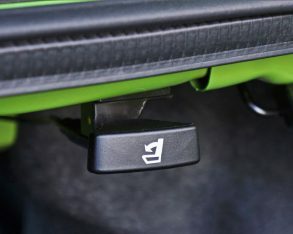 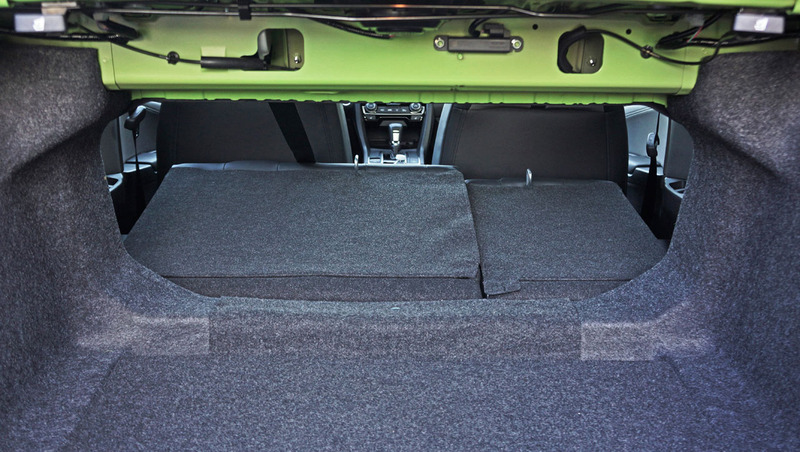 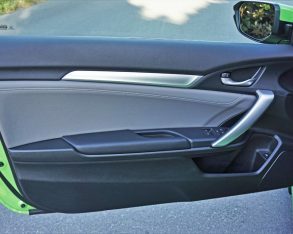 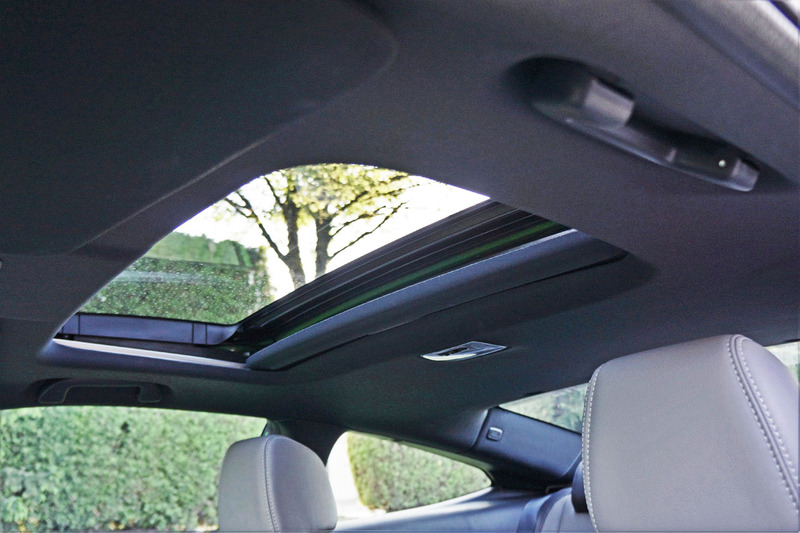 managing cargo and equipped with handy release pulls under the lid, the Civic Coupe Touring’s 337-litre trunk (which is six litres larger than last year’s Civic Coupe Touring) fairly sizeable for the class. 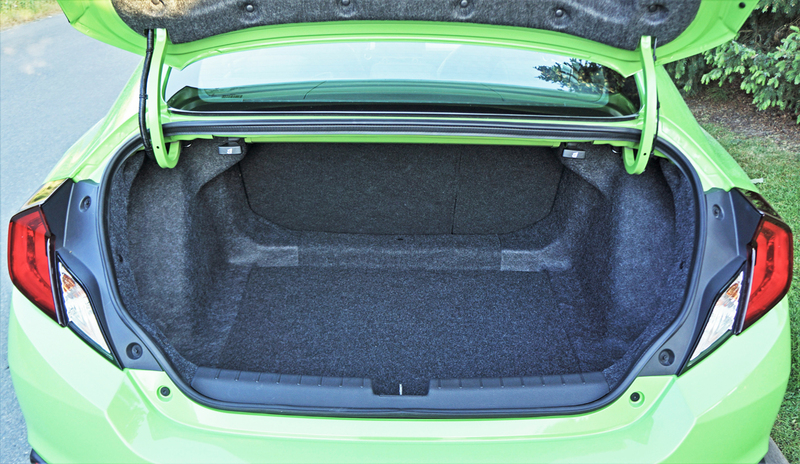 That trunk is the Coupe’s most interesting element, although I’m now referring to the way it looks from outside. 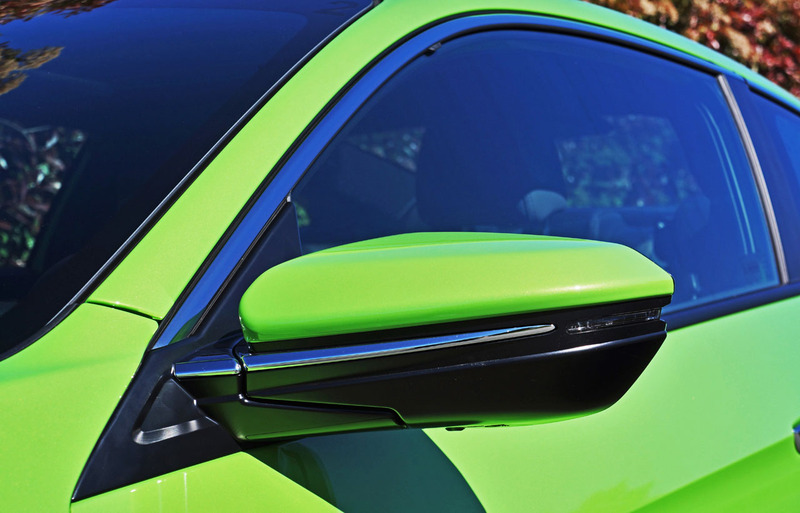 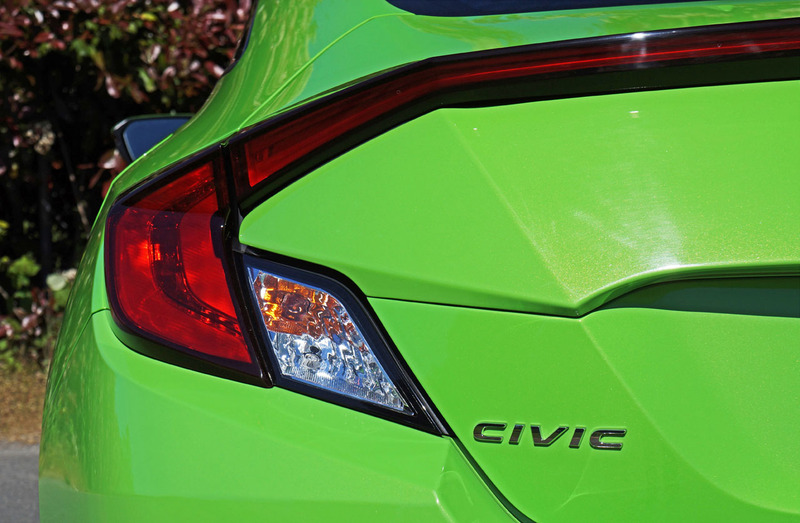 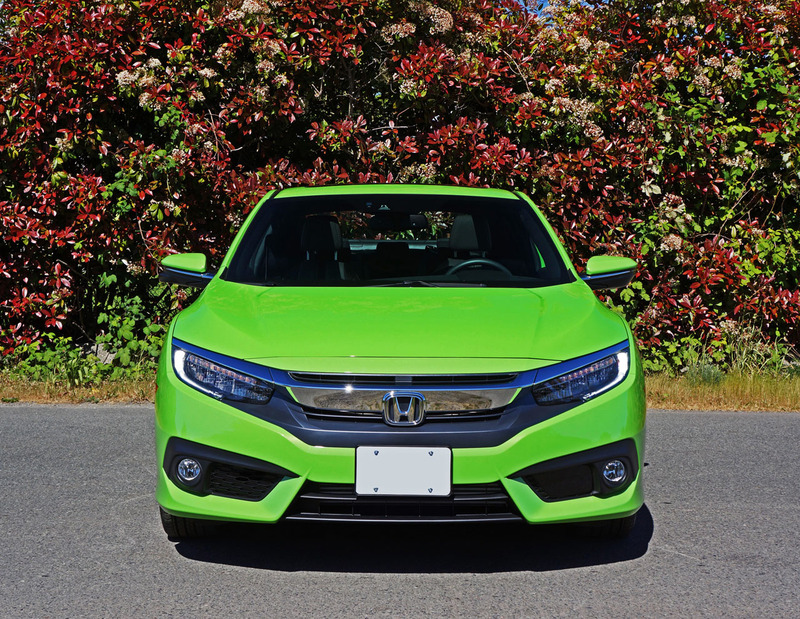 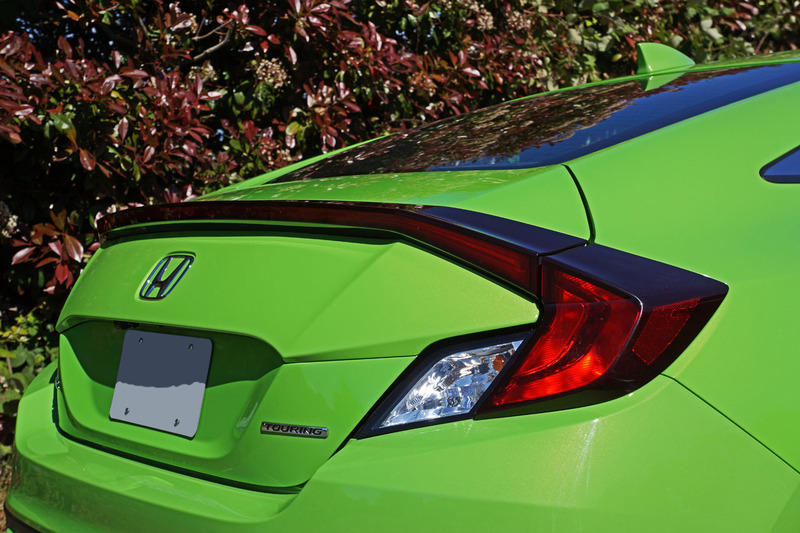 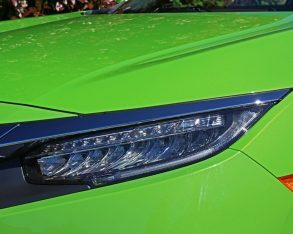 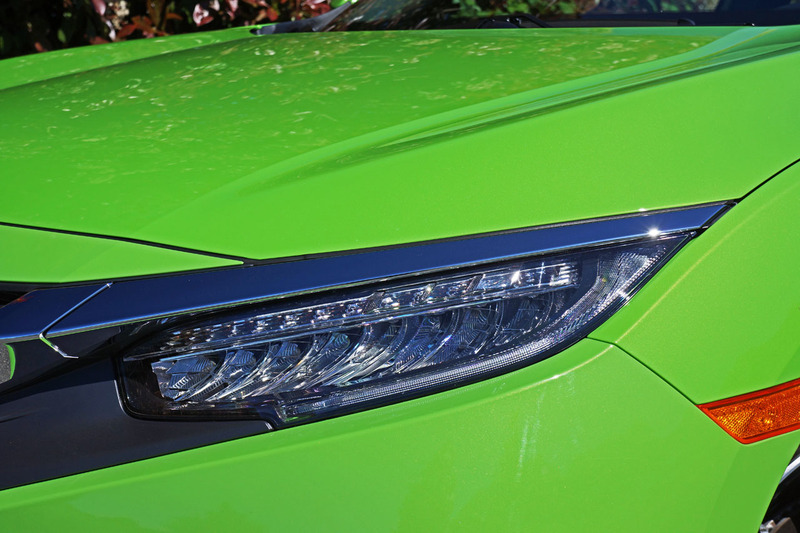 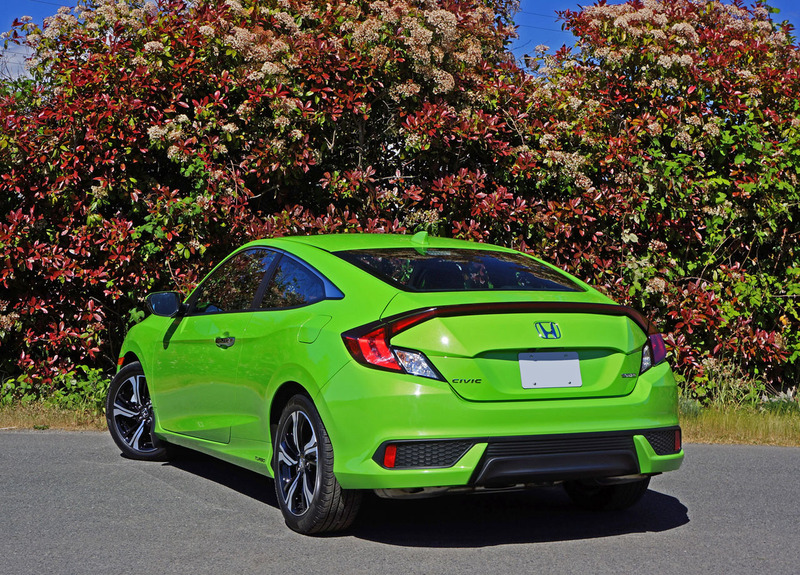 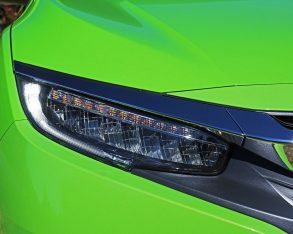 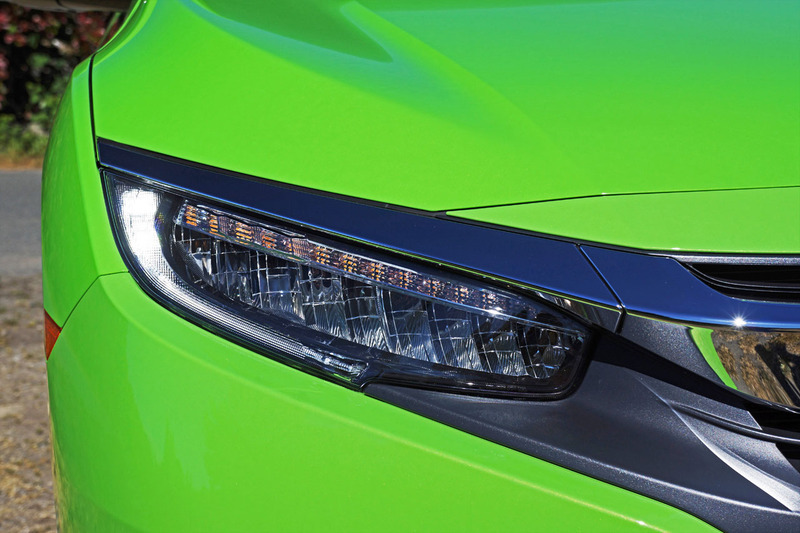 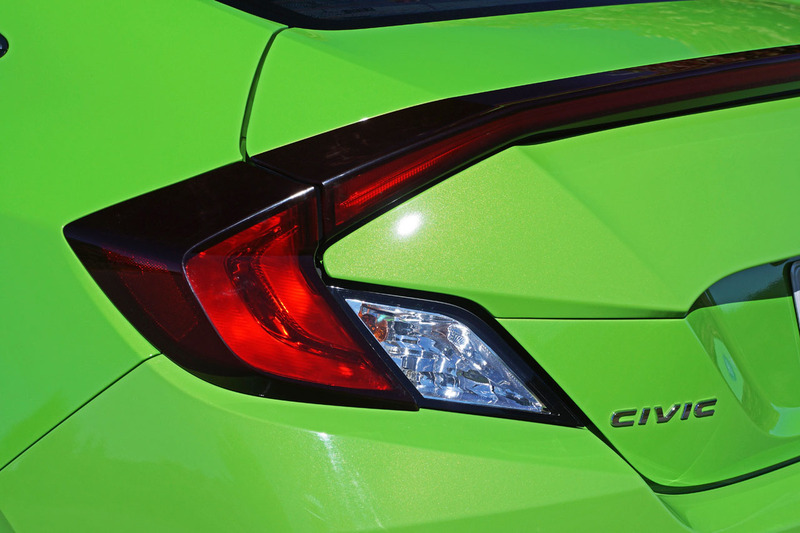 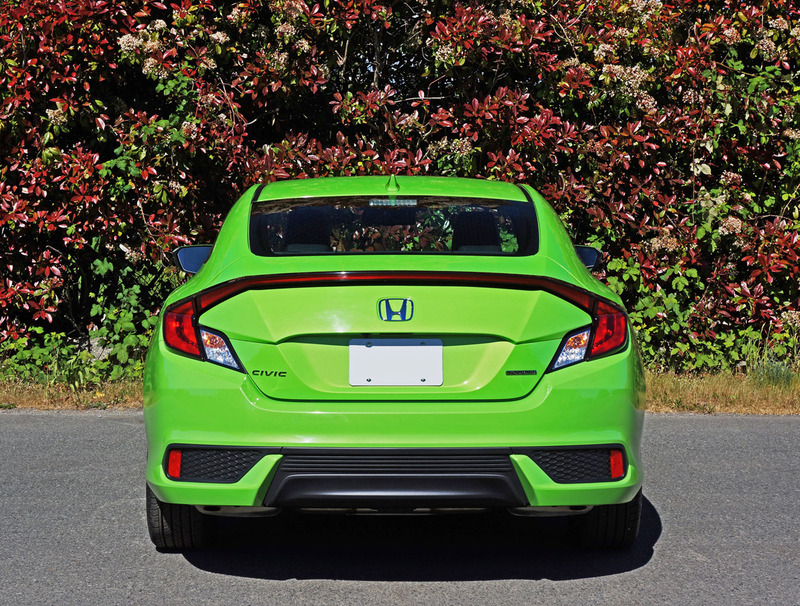 Honda had already taken the compact segment on a complete visual departure when the Civic Sedan arrived on the scene, but the Coupe’s wrap-over taillight design is even more unusual. 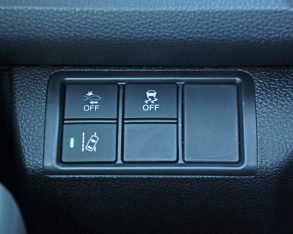 It’ll be sure to cause division amongst friends and family, with lovers and haters alike, but at least no one will call it boring anymore. 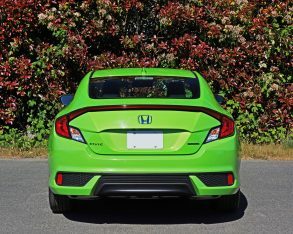 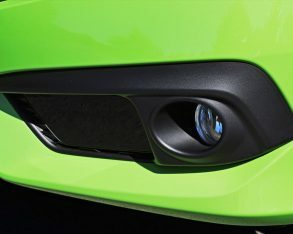 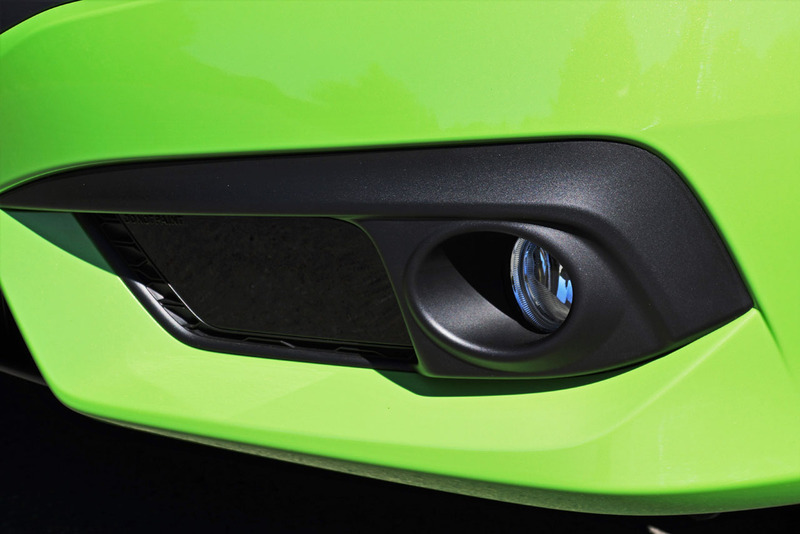 Honda finishes off the rear bumper with a diffuser-like black mesh insert that pulls cues from the lower front fascia, my tester’s upgraded with a nice set of circular fogs and even more impressive full LED headlamps. 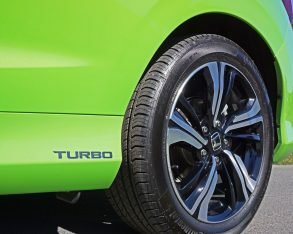 come standard with the Touring, a model that also includes the aforementioned 17-inch alloys on 215/50R17s, plus most every other feature you’d expect on and within a fully loaded compact such as auto on/off headlights, LED turn signals on the side mirrors, LED taillights, remote start, proximity-sensing access with pushbutton ignition, walk-away powered locks, heatable powered side mirrors, an auto-dimming rearview mirror, an electromechanical parking brake, one-touch turn signals, rain-sensing wipers, navigation, Bluetooth phone and audio streaming, HD and satellite radio, multiple USB ports, a powered moonroof, plus everything already covered and more, not to mention all the gear pulled up from LX and EX-T trims. 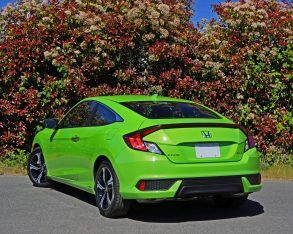 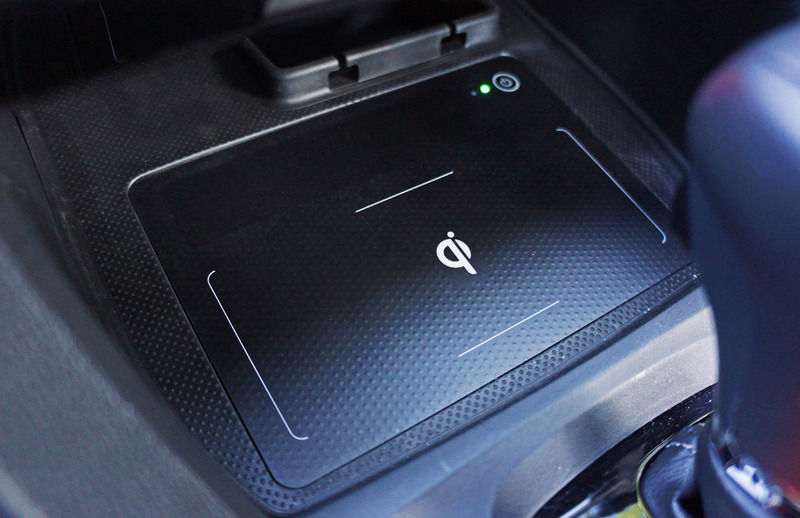 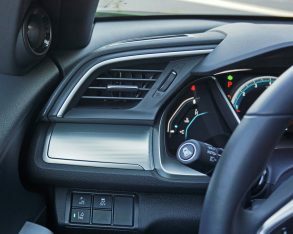 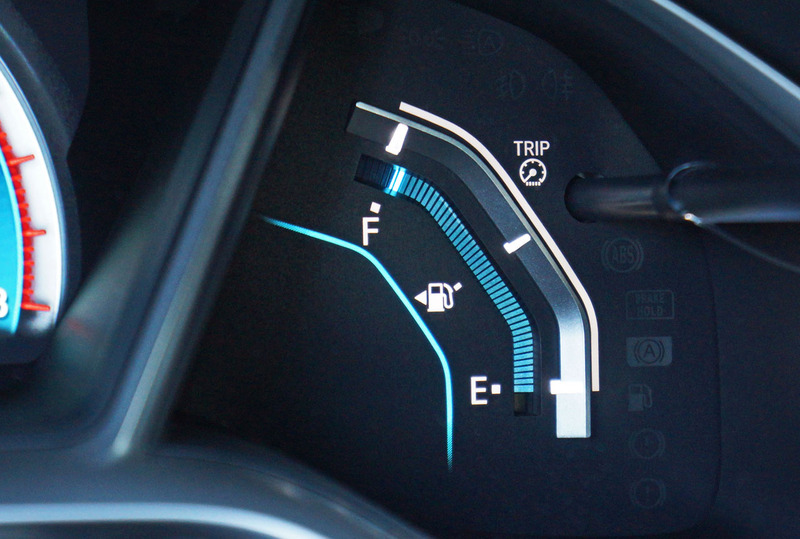 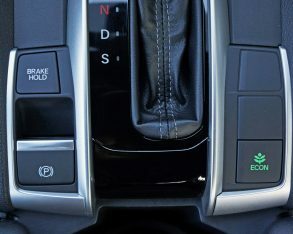 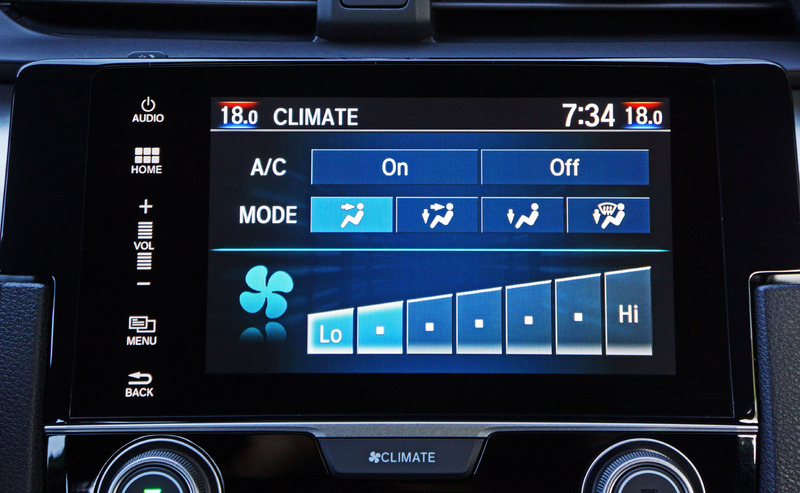 mitigation braking, plus lane departure warning, lane keeping assist and road departure mitigation, as well as adaptive cruise control with low-speed follow, which just happens to be most of the electronic equipment needed for an autonomous car, although the Civic Coupe isn’t set up for self-driving yet. 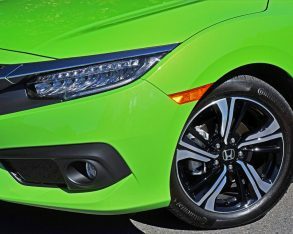 So equipped it achieves IIHS Top Safety Pick Plus status, mind you, whereas all Civics are good for five stars from the NHTSA. 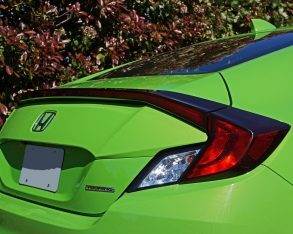 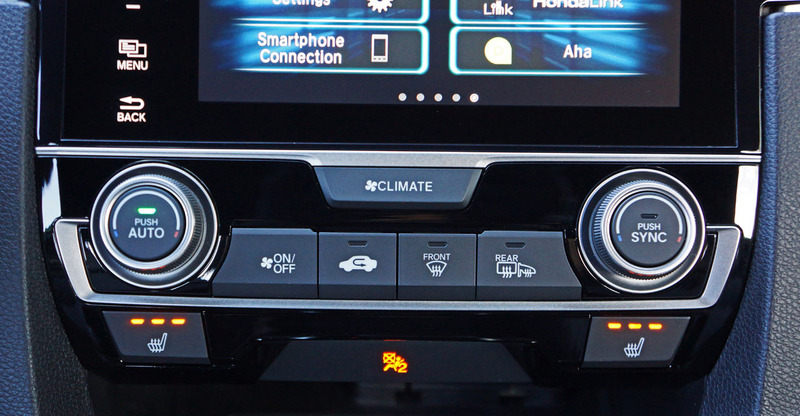 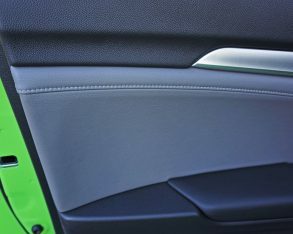 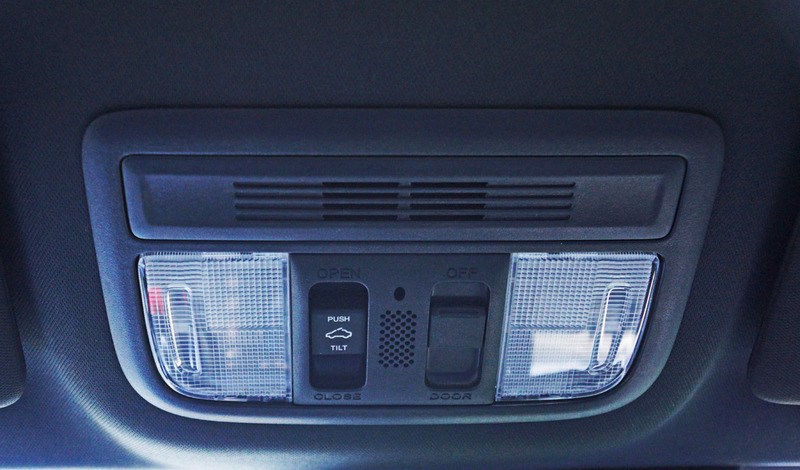 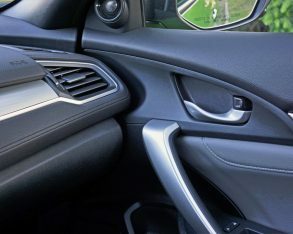 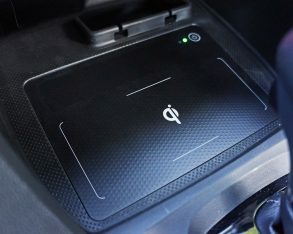 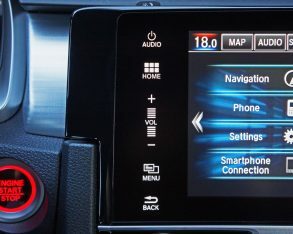 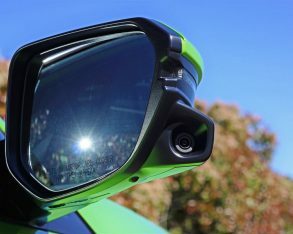 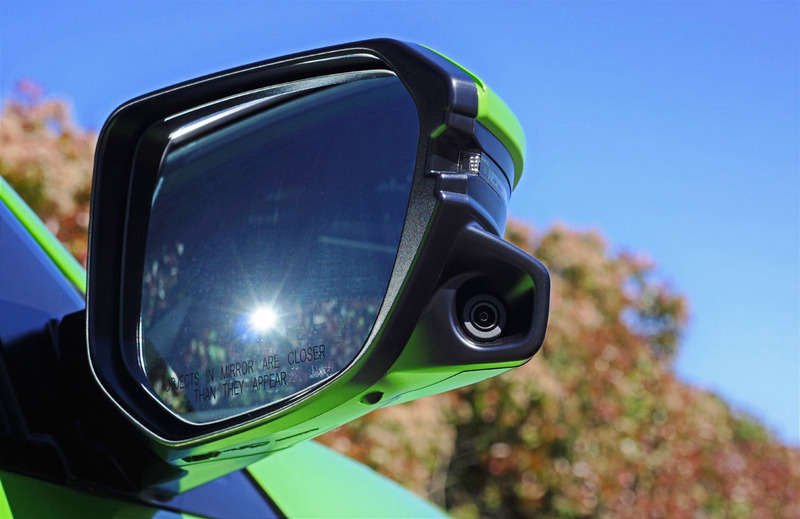 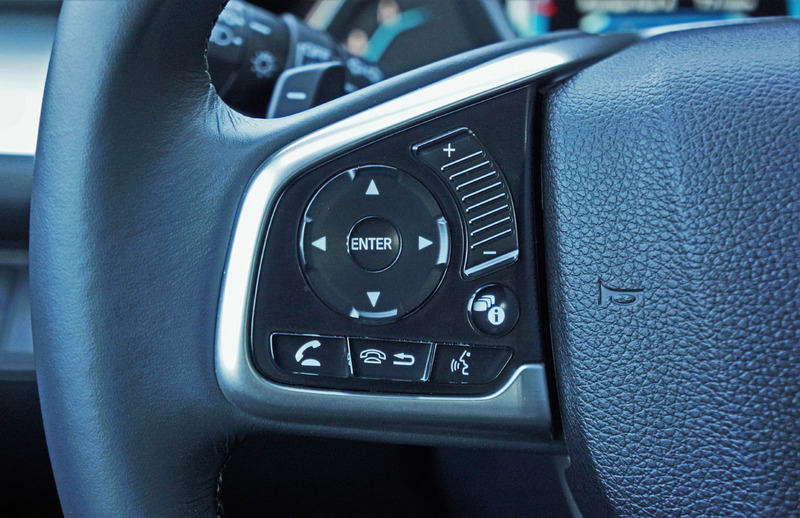 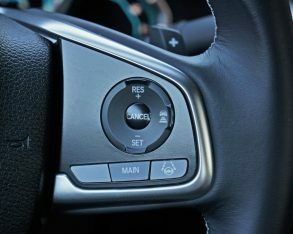 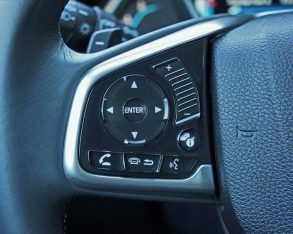 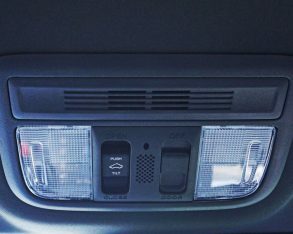 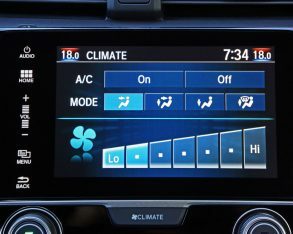 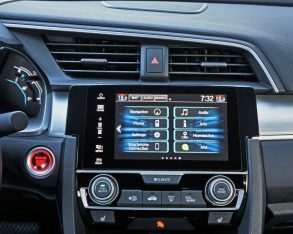 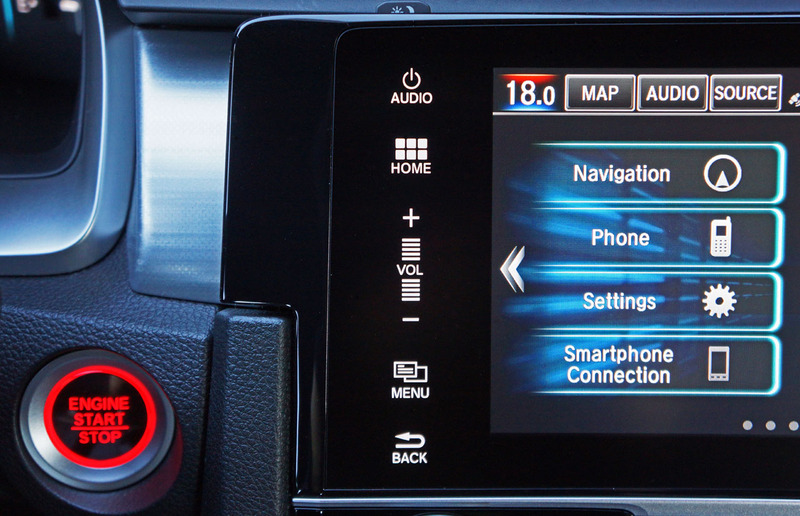 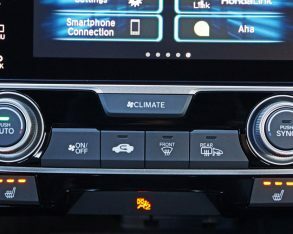 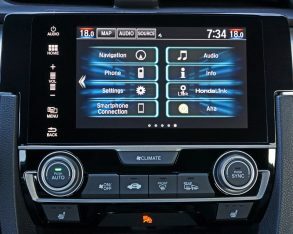 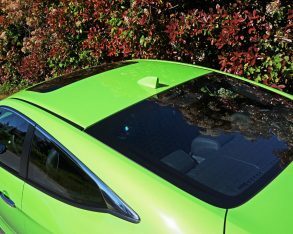 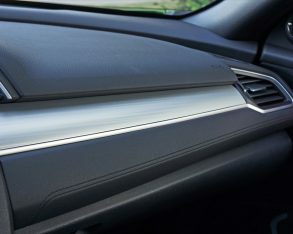 One of my all-time favourite active driving aids is Honda’s exclusive LaneWatch blindspot display that shows a passenger-side rearward view on the infotainment screen when flicking the turn signal to the right, while the Civic Coupe gets all of the usual standard active and passive safety gear. 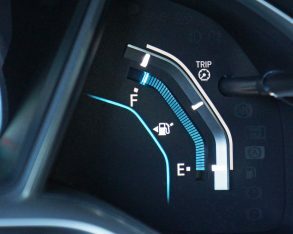 Handling Assist (AHA) to improve responsiveness. 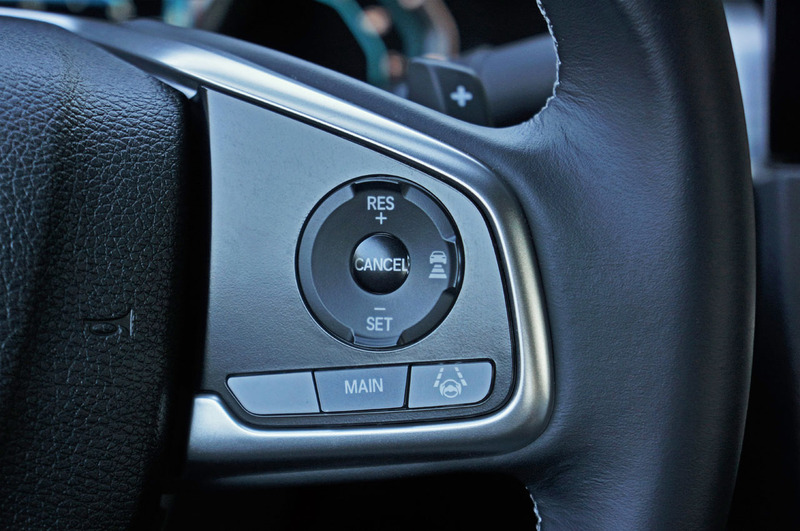 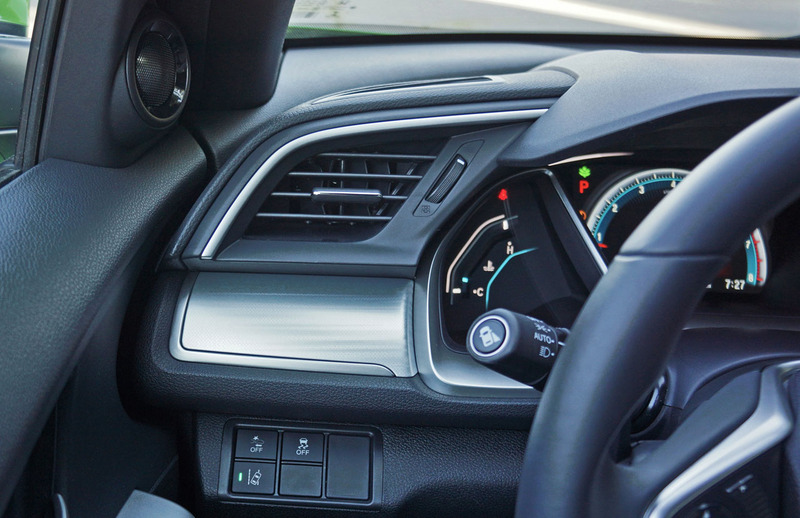 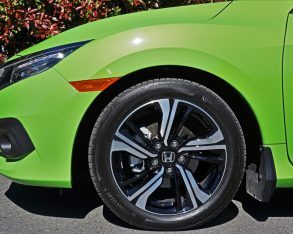 AHA applies unnoticeable braking force to the inside wheels when the steering wheel is turned, and then the same to the outside wheels when steering is returned. 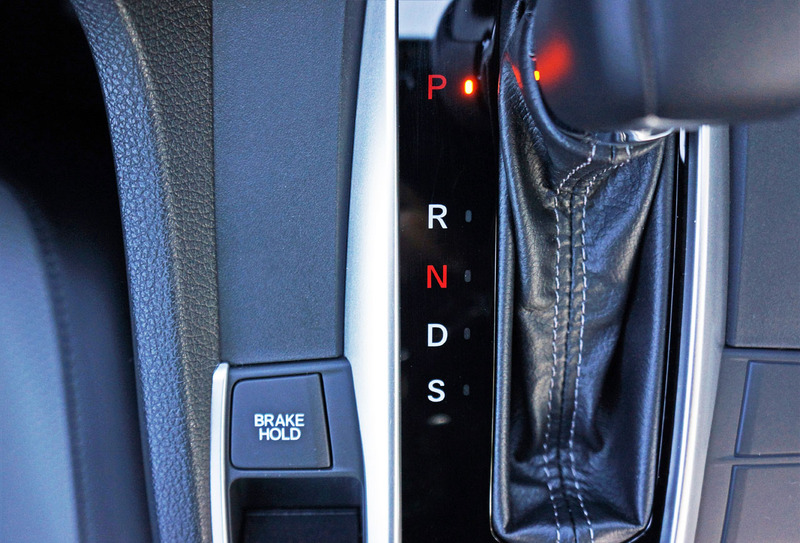 Additionally, Straight Driving Assist reduces steering effort when moving on a sloped or crowned road surface. 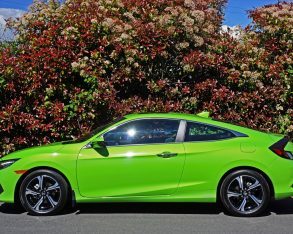 All Civics ride an a comfortable yet very capable independent front strut and rear multi-link suspension with stabilizer bars front and rear, the Coupe’s setup tuned a bit more for performance than the Sedan’s, while I found the electrically assisted rack-and-pinion steering quite plenty responsive with decent feedback for a front driver. 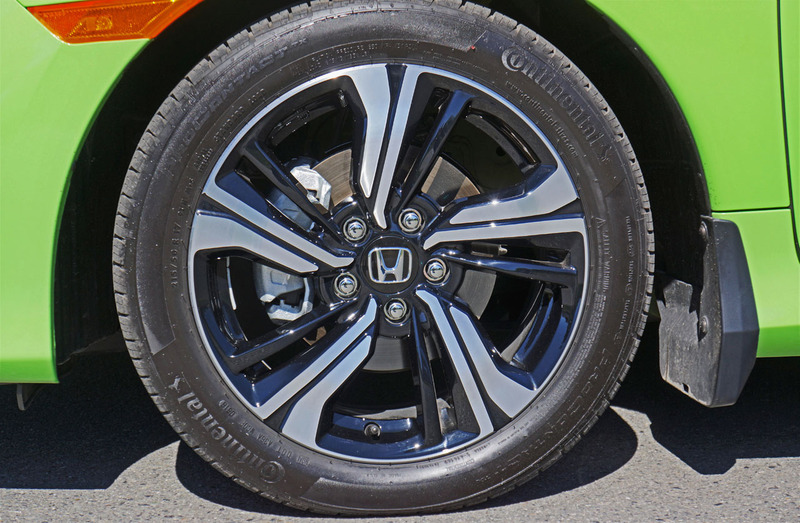 Likewise, braking is excellent for the class. 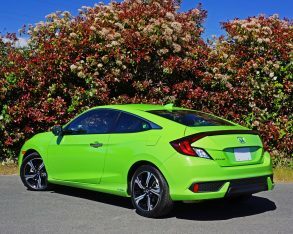 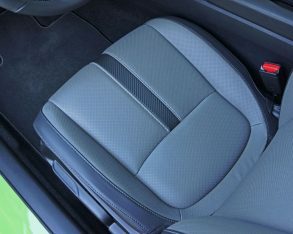 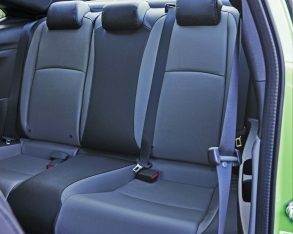 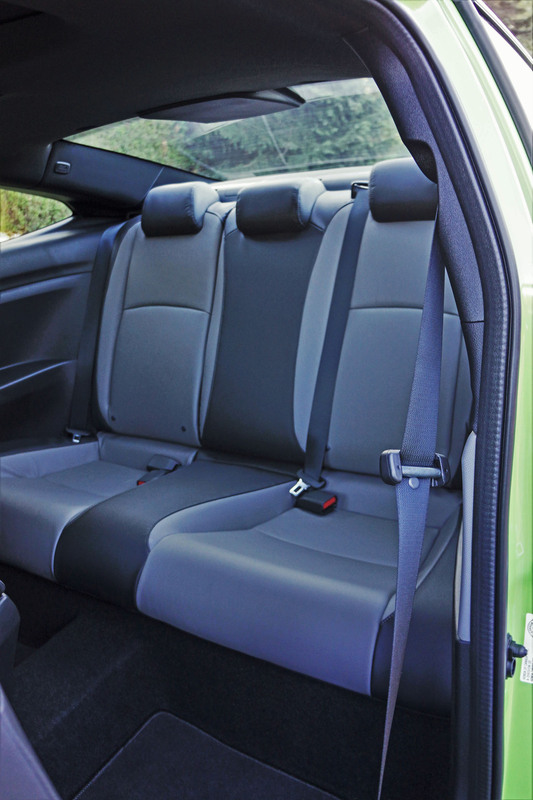 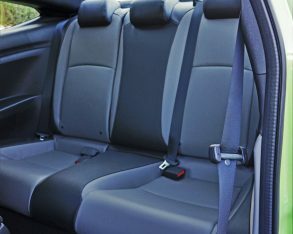 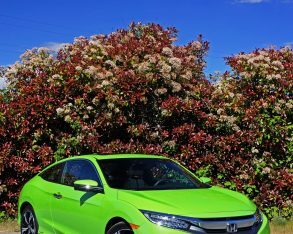 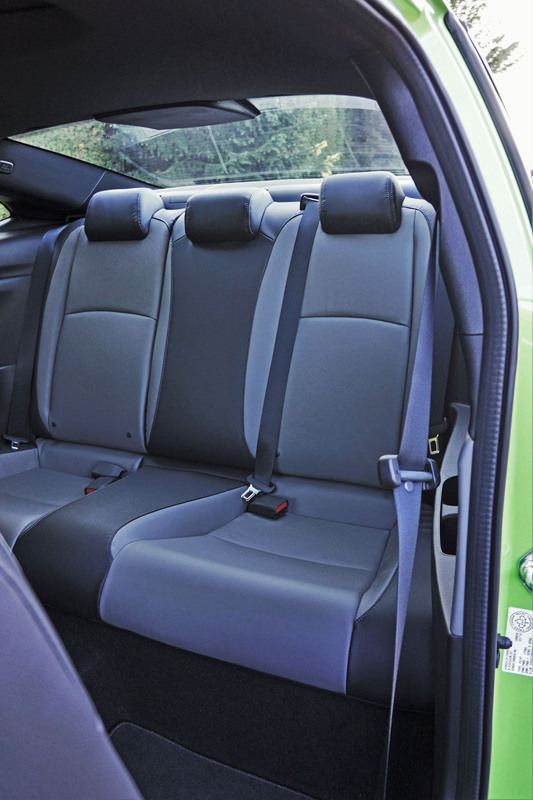 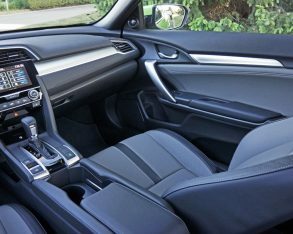 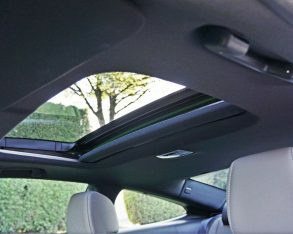 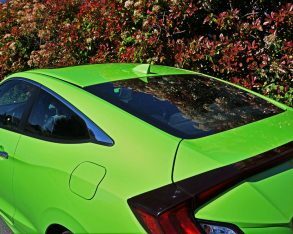 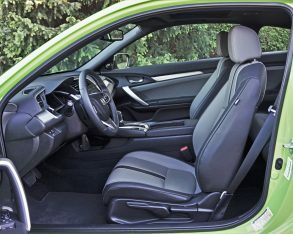 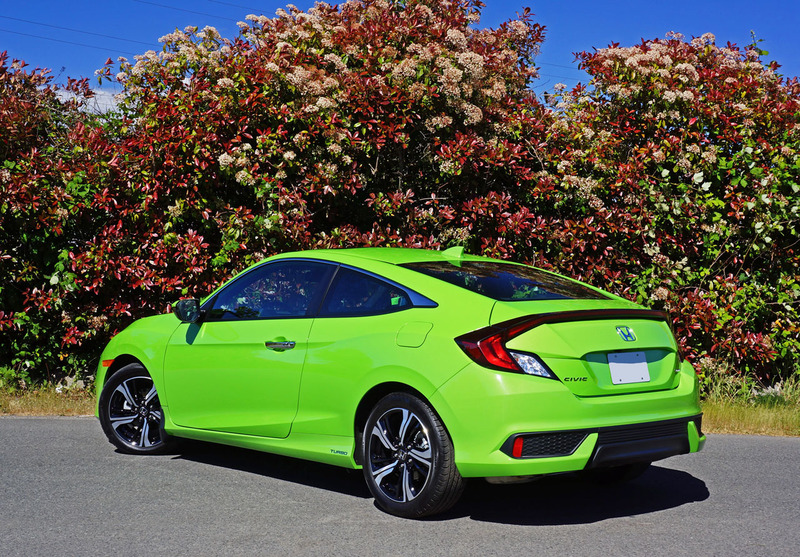 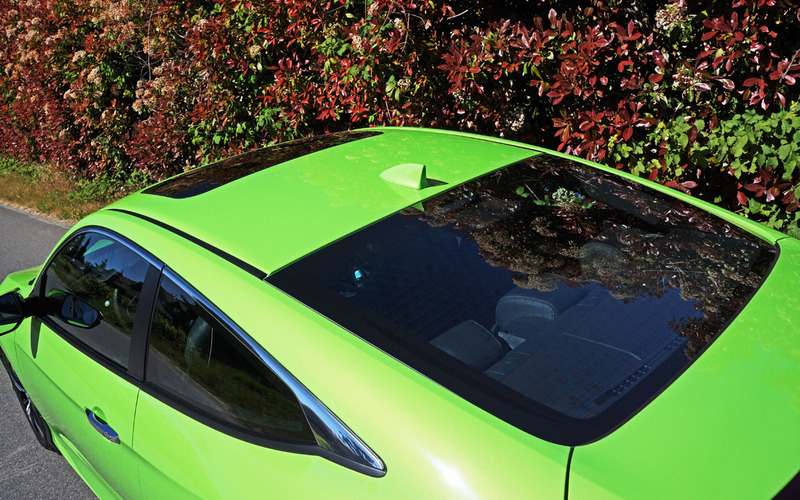 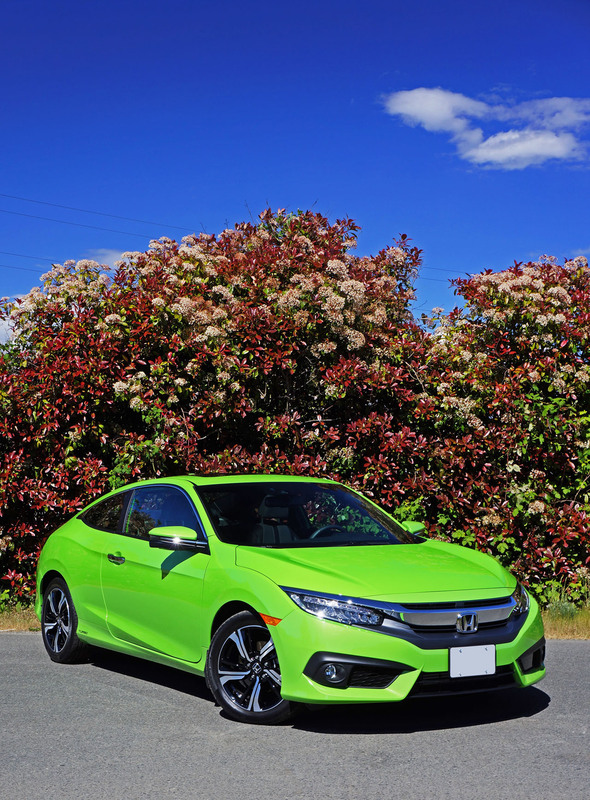 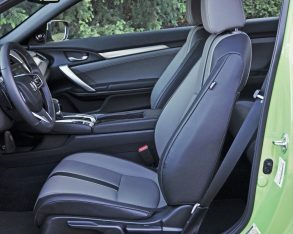 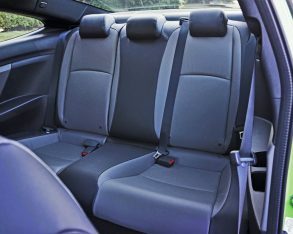 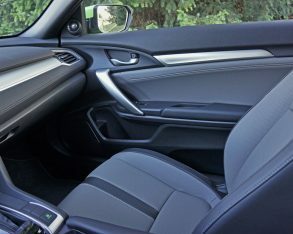 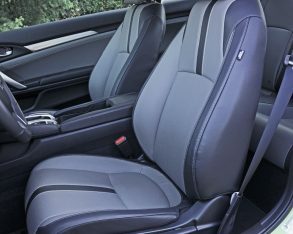 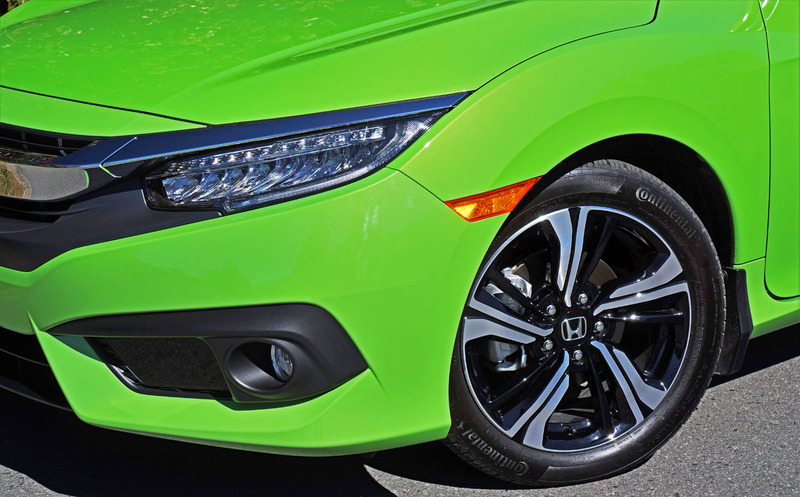 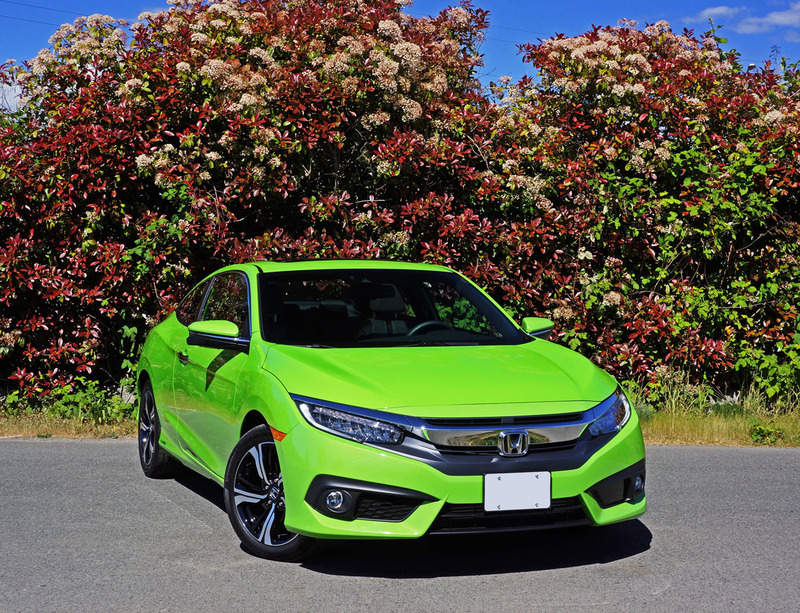 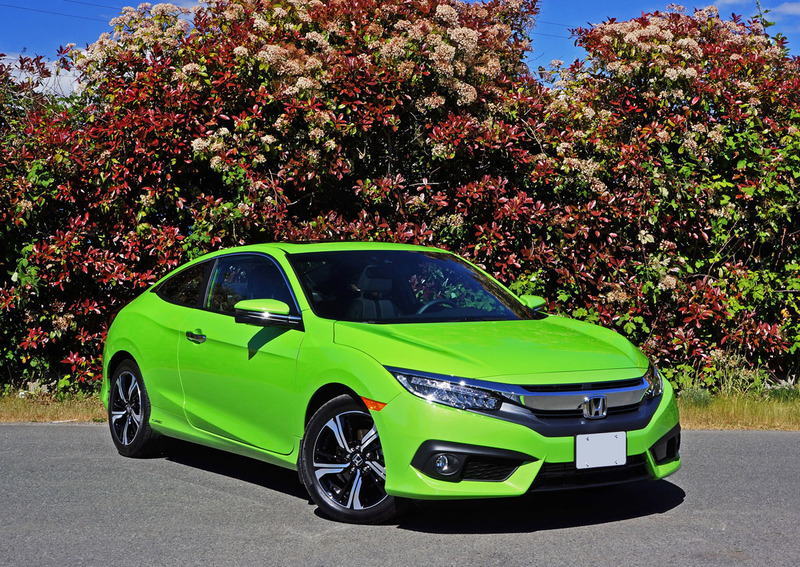 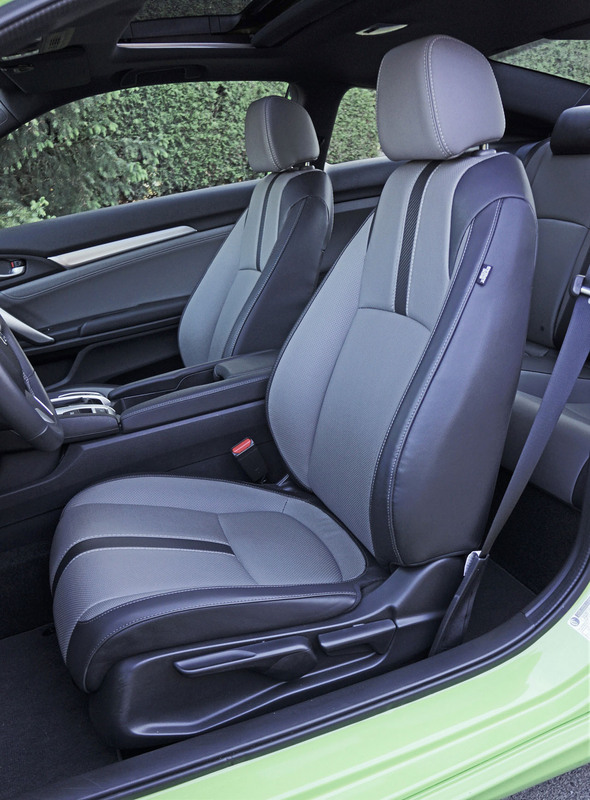 Still, there are a number of other sporty two-door hardtops in the Civic Coupe’s compact class that are more exciting to drive, and not just because of the CVT, although few offer rear seating anywhere near as comfortable or a trunk as large. 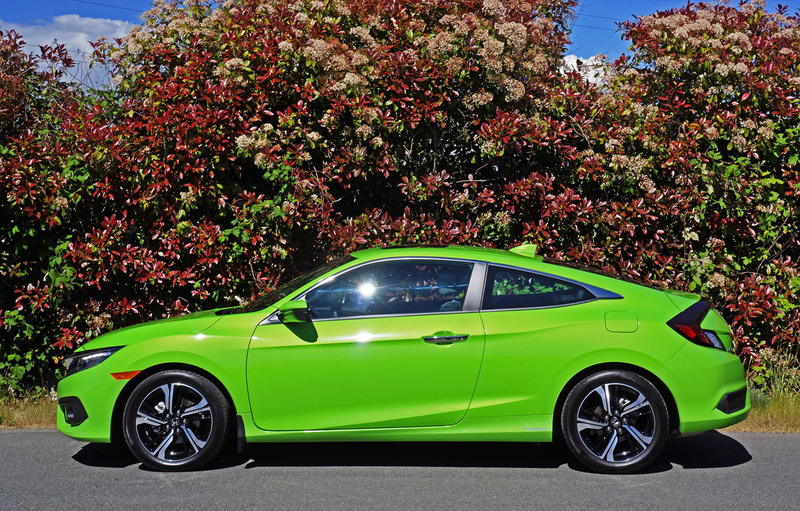 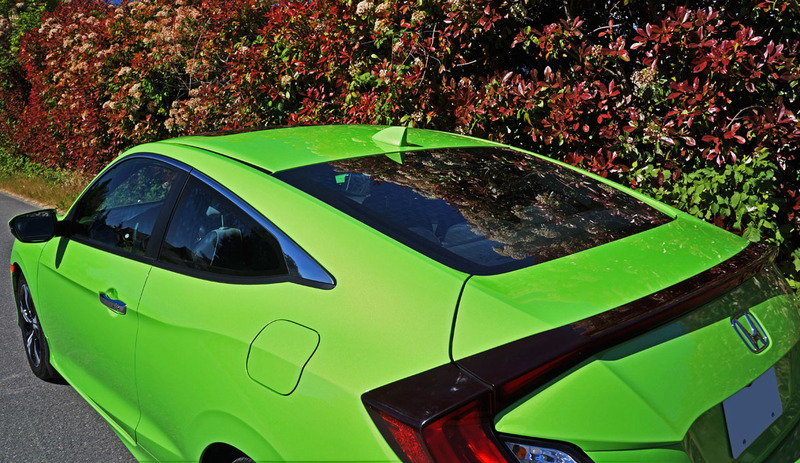 The Civic Coupe is therefore a compromise, but it hardly compromises on style, technology, build quality, or safety. 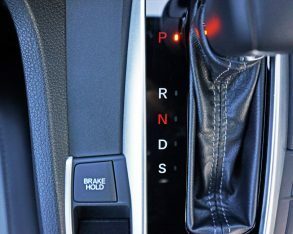 Rather, it’s by far the class leader in all of the above.